Much of applied mathematics, particularly the more recent computer-related areas which cut across the older disciplines, suffers from the lack of an adequate programming language. 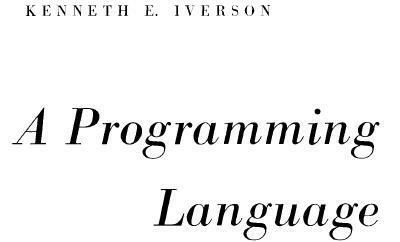 It is the central thesis of this book that the descriptive and analytic power of an adequate programming language amply repays the considerable effort required for its mastery. This thesis is developed by first presenting the entire language and then applying it in later chapters to several major topics. The areas of application are chosen primarily for their intrinsic interest and lack of previous treatment, but they are also designed to illustrate the universality and other facets of the language. For example, the microprogramming of Chapter 2 illustrates the divisibility of the language, i.e., the ability to treat a restricted area using only a small portion of the complete language. Chapter 6 (Sorting) shows its capacity to compass a relatively complex and detailed topic in a short space. Chapter 7 (The Logical Calculus) emphasizes the formal manipulability of the language and its utility in theoretical work. The material was developed largely in a graduate course given for several years at Harvard and in a later course presented repeatedly at the IBM Systems Research Institute in New York. It should prove suitable for a two-semester course at the senior or graduate level. Although for certain audiences an initial presentation of the entire language may be appropriate, I have found it helpful to motivate the development by presenting the minimum notation required for a given topic, proceeding to its treatment (e.g., microprogramming), and then returning to further notation. The 130-odd problems not only provide the necessary finger exercises but also develop results of general interest. Chapter 1 or some part of it is prerequisite to each of the remaining “applications” chapters, but the applications chapters are virtually independent of one another. A complete appreciation of search techniques (Chapter 4) does, however, require a knowledge of methods of representation (Chapter 3). The cross references which do occur in the applications chapters are either nonessential or are specific to a given figure, table, or program. The entire language presented in Chapter 1 is summarized for reference at the end of the book. In any work spanning several years it is impossible to acknowledge adequately the many contributions made by others. Two major acknowledgments are in order: the first to Professor Howard Aiken, Director Emeritus of the Harvard Computation Laboratory, and the second to Dr. F.P. Brooks, Jr. now of IBM. It was Professor Aiken who first guided me into this work and who provided support and encouragement in the early years when it mattered. The unusually large contribution by Dr. Brooks arose as follows. Several chapters of the present work were originally prepared for inclusion in a joint work which eventually passed the bounds of a single book and evolved into our joint Automatic Data Processing and the present volume. Before the split, several drafts of these chapters had received careful review at the hands of Dr. Brooks, reviews which contributed many valuable ideas on organization, presentation, and direction of investigation, as well as numerous specific suggestions. The contributions of the 200-odd students who suffered through the development of the material must perforce be acknowledged collectively, as must the contributions of many of my colleagues at the Harvard Computation Laboratory. To Professor G.A. Salton and Dr. W.L. Eastman, I am indebted for careful reading of drafts of various sections and for comments arising from their use of some of the material in courses. Dr. Eastman, in particular, exorcised many subtle errors from the sorting programs of Chapter 6. To Professor A.G. Oettinger and his students I am indebted for many helpful discussions arising out of his early use of the notation. My debt to Professor R.L. Ashenhurst, now of the University of Chicago, is apparent from the references to his early (and unfortunately unpublished) work in sorting. Of my colleagues at the IBM Research Center, Messrs. L.R. Johnson and A.D. Falkoff, and Dr. H. Hellerman have, through their own use of the notation, contributed many helpful suggestions. I am particularly indebted to L.R. Johnson for many fruitful discussions on the applications of trees, and for his unfailing support. On the technical side, I have enjoyed the assistance of unusually competent typists and draughtsmen, chief among them being Mrs. Arthur Aulenback, Mrs. Philip J. Seaward, Jr., Mrs. Paul Bushek, Miss J.L. Hegeman, and Messrs. William Minty and Robert Burns. Miss Jacquelin Sanborn provided much early and continuing guidance in matters of style, format, and typography. I am indebted to my wife for assistance in preparing the final draft. Applied mathematics is concerned with the design and analysis of algorithms or programs. The systematic treatment of complex algorithms requires a suitable programming language for their description, and such a programming language should be concise, precise, consistent over a wide area of application, mnemonic, and economical of symbols; it should exhibit clearly the constraints on the sequence in which operations are performed; and it should permit the description of a process to be independent of the particular representation chosen for the data. Existing languages prove unsuitable for a variety of reasons. Computer coding specifies sequence constraints adequately and is also comprehensive, since the logical functions provided by the branch instructions can, in principle, be employed to synthesize any finite algorithm. However, the set of basic operations provided is not, in general, directly suited to the execution of commonly needed processes, and the numeric symbols used for variables have little mnemonic value. Moreover, the description provided by computer coding depends directly on the particular representation chosen for the data, and it therefore cannot serve as a description of the algorithm per se. Ordinary English lacks both precision and conciseness. The widely used Goldstine-von Neumann (1947) flowcharting provides the conciseness necessary to an over-all view of the processes, only at the cost of suppressing essential detail. The so-called pseudo-English used as a basis for certain automatic programming systems suffers from the same defect. Moreover, the potential mnemonic advantage in substituting familiar English words and phrases for less familiar but more compact mathematical symbols fails to materialize because of the obvious but unwonted precision required in their use. Most of the concepts and operations needed in a programming language have already been defined and developed in one or another branch of mathematics. Therefore, much use can and will be made of existing notations. However, since most notations are specialized to a narrow field of discourse, a consistent unification must be provided. For example, separate and conflicting notations have been developed for the treatment of sets, logical variables, vectors, matrices, and trees, all of which may, in the broad universe of discourse of data processing, occur in a single algorithm. A set of statements together with a specified order of execution constitutes a program. The program is finite if the number of executions is finite. The results of the program are some subset of the quantities specified by the program. The sequence or order of execution will be defined by the order of listing and otherwise by arrows connecting any statement to its successor. A cyclic sequence of statements is called a loop. Thus Program 1.1 is a program of two statements defining the result v as the (approximate) area of a circle of radius x, whereas Program 1.2 is an infinite program in which the quantity z is specified as (2y)n on the nth execution of the two statement loop. Statements will be numbered on the left for reference. A number of similar programs may be subsumed under a single more general program as follows. At certain branch points in the program a finite number of alternative statements are specified as possible successors. One of these successors is chosen according to criteria determined in the statement or statements preceding the branch point. These criteria are usually stated as a comparison or test of a specified relation between a specified pair of quantities. A branch is denoted by a set of arrows leading to each of the alternative successors, with each arrow labeled by the comparison condition under which the corresponding successor is chosen. The quantities compared are separated by a colon in the statement at the branch point, and a labeled branch is followed if and only if the relation indicated by the label holds when substituted for the colon. The conditions on the branches of a properly defined program must be disjoint and exhaustive. Program 1.3 illustrates the use of a branch point. Statement α5 is a comparison which determines the branch to statements β1, δ1, or γ1, according as z > n, z = n, or z < n. The program represents a crude by effective process for determining x = n2/3 for any positive cube n.
Program 1.4 shows the preceding program reorganized into a compact linear array and introduces two further conventions on the labeling of branch points. The listed successor of a branch statement is selected if none of the labeled conditions is met. Thus statement 6 follows statement 5 if neither of the arrows (to exit or to statement 8) are followed, i.e. if z < n. Moreover, any unlabeled arrow is always followed; e.g., statement 7 is invariably followed by statement 3, never by statement 8. A program begins at a point indicated by an entry arrow (step 1) and ends at a point indicated by an exit arrow (step 5). There are two useful consequences of confining a program to the form of a linear array: the statements may be referred to by a unique serial index (statement number), and unnecessarily complex organization of the program manifests itself in crossing branch lines. The importance of the latter characteristic in developing clear and comprehensible programs is not sufficiently appreciated. where the dimensions of an m × n matrix X (of m rows and n columns) is denoted by μ(X) × ν(X). Program 1.5. Steps 1-3 initialize the indices, and the loop 5-7 continues to add successive products to the partial sum until k reaches zero. When this occurs, the process continues through step 8 to decrement j and to repeat the entire summation for the new value of j, providing that it is not zero. If j is zero, the branch to step 10 decrements i and the entire process over j and k is repeated from j = ν(B), providing that i is not zero. If i is zero, the process is complete, as indicated by the exit arrow. In all examples used in this chapter, emphasis will be placed on clarity of description of the process, and considerations of efficient execution by a computer or class of computers will be subordinated. These considerations can often be introduced later by relatively routine modifications of the program. For example, since the execution of a computer operation involving an indexed variable is normally more costly than the corresponding operation upon a nonindexed variable, the substitution of a variable s for the variable Cji specified by statement 5 of Program 1.5 would accelerate the execution of the loop. The variable s would be initialized to zero before each entry to the loop and would be used to specify Cji at each termination. The practice of first setting an index to its maximum value and then decrementing it (e.g., the index k in Program 1.5) permits the termination comparison to be made with zero. Since zero often occurs in comparisons, it is convenient to omit it. Thus, if a variable stands alone at a branch point, comparison with zero is implied. Moreover, since a comparison on an index frequently occurs immediately after it is modified, a branch at the point of modification will denote branching upon comparison of the indicated index with zero, the comparison occurring after modification. Designing programs to execute decisions immediately after modification of the controlling variable results in efficient execution as well as notational elegance, since the variable must be present in a central register for both operations. Since the sequence of execution of statements is indicated by connecting arrows as well as by the order of listing, the latter can be chosen arbitrarily. This is illustrated by the functionally identical Programs 1.3 and 1.4. Certain principles of ordering may yield advantages such as clarity or simplicity of the pattern of connections. Even though the advantages of a particular organizing principle are not particularly marked, the uniformity resulting from its consistent application will itself be a boon. The scheme here adopted is called the method of leading decisions: the decision on each parameter is placed as early in the program as practicable, normally just before the operations indexed by the parameter. This arrangement groups at the head of each iterative segment the initialization, modification, and the termination test of the controlling parameter. Moreover, it tends to avoid program flaws occasioned by unusual values of the argument. For example, Program 1.6 (which is a reorganization of Program 1.5) behaves properly for matrices of dimension zero, whereas Program 1.5 treats every matrix as if it were of dimension one or greater. Although the labeled arrow representation of program branches provides a complete and graphic description, it is deficient in the following respects: (1) a routine translation to another language (such as computer code) would require the tracing of arrows, and (2) it does not permit programmed modification of the branches. x : y, r → s.
This denotes a branch to statement number si of the program if the relation xr i y holds. The parameters r and s may themselves be defined and redefined in other parts of the program. The null element ∘ will be used to denote the relation which complements the remaining relations r i; in particular, (∘)→(s), or simply →s, will denote an unconditional branch to statement s. Program 1.7 shows the use of these conventions in a reformulation of Program 1.6. More generally, two or more otherwise independent programs may interact through a statement in one program specifying a branch in a second. The statement number occurring in the branch must then be augmented by the name of the program in which the branch is effected. Thus the statement (∘) → Program 2.24 executed in Program 1 causes a branch to step 24 to occur in Program 2. One statement in a program can be modified by another statement which changes certain of its parameters, usually indices. More general changes in statements can be effected by considering the program itself as a vector p whose components are the individual, serially numbered statements. All the operations to be defined on general vectors can then be applied to the statements themselves. For example, the jth statement can be respecified by the ith through the occurrence of the statement pj ← pi. The interchange of two quantities y and x (that is, x specifies y and the original value of y specifies x) will be denoted by the statement y ↔ x. The Summary of Notation at the end of the book summarizes the notation developed in this chapter. Although intended primarily for reference, it supplements the text in several ways. It frequently provides a more concise alternative definition of an operation discussed in the text, and it also contains important but easily grasped extensions not treated explicitly in the text. By grouping the operations into related classes it displays their family relationships. A concise programming language must incorporate families of operations whose members are related in a systematic manner. Each family will be denoted by a specific operation symbol, and the particular member of the family will be designated by an associated controlling parameter (scalar, vector, matrix, or tree) which immediately precedes the main operation symbol. The operand is placed immediately after the main operation symbol. For example, the operation k ↑ x (left rotation of x by k places) may be viewed as the kth member of the set of rotation operators denoted by the symbol ↑. Operations involving a single operand and no controlling parameter (such as ⌊x⌋, or ⌈x⌉) will be denoted by a pair of operation symbols which enclose the operand. Operations involving two operands and a controlling parameter (such as the mask operation /a, u, b/) will be denoted by a pair of operation symbols enclosing the entire set of variables, and the controlling parameter will appear between the two operands. In these cases the operation symbols themselves serve as grouping symbols. In interpreting a compound operation such as k ↑ (j ↓ x) it is important to recognize that the operation symbol and its associated controlling parameter together represent an indivisible operation and must not be separated. It would, for example, be incorrect to assume that j ↑ (k ↓ x) were equivalent to k ↑ (j ↓ x), although it can be shown that the complete operations j ↓ and k ↑ do commute, that is k ↑ (j ↓ x) = j ↓ (k ↑ x). The need for parentheses will be reduced by assuming that compound statements are, except for intervening parentheses, executed from right to left. Thus k ↑ j ↓ x is equivalent to k ↑ (j ↓ x), not to (k ↑ j) ↓ x. Structured operands such as vectors and matrices, together with a systematic component-by-component generalization of elementary operations, provide an important subordination of detail in the description of algorithms. The use of structured operands will be facilitated by selection operations for extracting a specified portion of an operand, reduction operations for extending an operation (such as logical or arithmetic multiplication) over all components, and permutation operations for reordering components. Operations defined on vectors are extended to matrices: the extended operation is called a row operation if the underlying vector operation is applied to each row of the matrix and a column operation if it is applied to each column. A column operation is denoted by doubling the symbol employed for the corresponding row (and vector) operation. A distinct typeface will be used for each class of operand as detailed in Table 1.8. Special quantities (such as the prefix vectors ⍺i defined in Sec. 1.7) will be denoted by Greek letters in the appropriate typeface. For mnemonic reasons, an operation closely related to such a special quantity will be denoted by the same Greek letter. For example, ⍺/u denotes the maximum prefix (Sec. 1.10) of the logical vector u. Where a Greek letter is indistinguishable from a Roman, sanserif characters will be used, e.g. E and I for the capitals of epsilon and iota. The power of any mathematical notation rests largely on the use of symbols to represent general quantities which, in given instances, are further specified by other quantities. Thus Program 1.4 represents a general process which determines x = n2/3 for any suitable value of n. In a specific case, say n = 27, the quantity x is specified as the number 9. Each operand occurring in a meaningful process must be specified ultimately in terms of commonly accepted concepts. The symbols representing such accepted concepts will be called literals. Examples of literals are the integers, the characters of the various alphabets, punctuation marks, and miscellaneous symbols such as $ and %. The literals occurring in Program 1.4 are 0, 1, 2. It is important to distinguish clearly between general symbols and literals. In ordinary algebra this presents little difficulty, since the only literals occurring are the integers and the decimal point, and each general symbol employed includes an alphabetic character. In describing more general processes, however, alphabetic literals (such as proper names) also appear. Moreover, in a computer program, numeric symbols (register addresses) are used to represent the variables. In general, then, alphabetic literals, alphabetic variables, numeric literals, and numeric variables may all appear in a complex process and must be clearly differentiated. The symbols used for literals will be Roman letters (enclosed in quotes when appearing in text) and standard numerals. The symbols used for variables will be italic letters, italic numerals, and boldface letters as detailed in Table 1.8. Miscellaneous signs and symbols when used as literals will be enclosed in quotes in both programs and text. It is sometimes desirable (e.g., for mnemonic reasons) to denote a variable by a string of alphabetic or other symbols rather than by a single symbol. The monolithic interpretation of such a string will be indicated by the tie used in musical notation, thus: and may denote the variable “inventory”, a vector of inventory values, and a matrix of inventory values, respectively. In the set of alphabetic characters, the space plays a special role. For other sets a similar role is usually played by some one element, and this element is given the special name of null element. In the set of numeric digits, the zero plays a dual role as both null element and numeric quantity. The null element will be denoted by the degree symbol ∘. In any determinate process, each operand must be specified ultimately in terms of literals. In Program 1.4, for example, the quantity k is specified in terms of known arithmetic operations (multiplication and division) involving the literals 1 and 2. The quantity n, on the other hand, is not determined within the process and must presumably be specified within some larger process which includes Program 1.4. Such a quantity is called an argument of the process. The class of arguments and the class of results of a given operator are called its domain and range, respectively. Thus the domain and range of the magnitude operation (|x|) are the real numbers and the nonnegative real numbers, respectively. A variable is classified according to the range of values it may assume: it is logical, integral, or numerical, according as the range is the set of logical variables (that is, 0 and 1), the set of integers, or the set of real numbers. Each of the foregoing classes is clearly a subclass of each class following it, and any operation defined on a class clearly applies to any of its subclasses. A variable which is nonnumeric will be called arbitrary. In the Summary of Notation, the range and domain of each of the operators defined is specified in terms of the foregoing classes according to the conventions shown in Sec. S.1. The elementary operations employed include the ordinary arithmetic operations, the elementary operations of the logical calculus, and the residue and related operations arising in elementary number theory. In defining operations in the text, the symbol ↔ will be used to denote equivalence of the pair of statements between which it occurs. According to the usual custom in ordinary algebra, the multiplication symbol may be elided. w ← ↔ w = 1 if and only if u = 0. (commonly called the sign function or sgn x) assumes the values 1, 0, or –1 according as x is strictly positive, 0, or strictly negative. Moreover, the magnitude function |x| may be defined as |x| = x × sgn x = x × ((x > 0) – (x < 0)). The relational statement is a useful generalization of the Kronecker delta, that is δji = (i = j). Moreover, it provides a convenient expression for a number of familiar logical operations. The exclusive or, for example, may be denoted by (u ≠ v), and its negation (i.e., the equivalence function) may be denoted by (u = v). n = bq + r, j ≤ r < j + b. The quantity r is called the j-residue of n modulo b and is denoted by b | j n. For example, 3 |0 9 = 0, 3 |1 9 = 3, and 3 |0 10 = 1. Moreover, if n ≥ 0, then b |0 n is the remainder obtained in dividing n by b and q is the integral part of the quotient. A number n is said to be of even parity if its 0-residue modulo 2 is zero and of odd parity if 2 |0 n = 1.
m ≡ n (mod b). In classical treatments, such as Wright (1939), only the 0-residue is considered. The use of 1-origin indexing (cf. Sec. 1.5) accounts for the interest of the 1-residue. 2. the ceiling of x, denoted by ⌈x⌉ and defined as the smallest integer not exceeded by x. ⌈3.00⌉ = 3, ⌊3.00⌋ = 3, ⌊–3.00⌋ = –3. Clearly ⌈x⌉ = –⌊–x⌋ and ⌊x⌋ ≤ x ≤ ⌈x⌉. Moreover, n = b⌊n ÷ b⌋ + b |0 n for all integers n. Hence the integral quotient ⌊n ÷ b⌋ is equivalent to the quantity q occurring in the definition of the j-residue for the case j = 0. Any operation defined on a single operand can be generalized to apply to each member of an array of related operands. Similarly, any binary operation (defined on two operands) can be generalized to apply to pairs of corresponding elements of two arrays. Since algorithms commonly incorporate processes which are repeated on each member of an array of operands, such generalization permits effective subordination of detail in their description. For example, the accounting process defined on the data of an individual bank account treats a number of distinct operands within the account, such as account number, name, and balance. Moreover, the over-all process is defined on a large number of similar accounts, all represented in a common format. Such structured arrays of variables will be called structured operands, and extensive use will be made of three types, called vector, matrix, and tree. As indicated in Sec. S.1 of the Summary of Notation, a structured operand is further classified as logical, integral, numerical, or arbitrary, according to the type of elements in contains. , xν(x)). The variable xi is called the ith component of the vector x, and the number of components, denoted by ν(x) (or simply by ν when the determining vector is clear from context), is called the dimension of x. Vectors and their components will be represented in lower case boldface italics. A numerical vector x may be multiplied by a numerical quantity k to produce the scalar multiple k × x (or kx) defined as the vector z such that z i = k × xi. w = (x < y) ↔ wi = (xi < yi). Thus if x = (1, 0, 1, 1) and y = (0, 1, 1, 0) then x + y = (1, 1, 2, 1), x ∧ y = (0, 0, 1, 0), and (x < y) = (0, 1, 0, 0). , M j μ) is called the jth column vector of M and is denoted by M j. Its dimension μ(M) is called the column dimension of the matrix. P = M N ↔ Mji Nji. xν). It is, however, convenient to admit more general j-origin indexing in which the set of successive integers employed as indices in any structured operand begin with a specified integer j. The two systems of greatest interest are the common 1-origin system, which will be employed almost exclusively in this chapter, and the 0-origin system. The latter system is particularly convenient whenever the index itself must be represented in a positional number system and will therefore be employed exclusively in the treatment of computer organization in Chapter 2.
z = k ↑ x ↔ z i = x j, where j = ν|1(i + k). z = k ↓ x ↔ z i = x j, where j = ν|1(i – k). If k = 1, it may be elided. Thus ↑ b = (a, n, d, y, c). Right rotation is extended analogously. Certain special vectors warrant special symbols. In each of the following definitions, the parameter n will be used to specify the dimension. The interval vector ⍳j(n) is defined as the vector of integers beginning with j. Thus ⍳0(4)=(0, 1, 2, 3), ⍳1(4)=(1, 2, 3, 4), and ⍳–7(5)= (–7, –6, –5, –4, –3). Four types of logical vectors are defined as follows. The jth unit vector ∊ j(n) has a one in the jth position, that is, (∊ j(n))k = (k = j). The full vector ∊(n) consists of all ones. The vector consisting of all zeros is denoted both by 0 and by (n). The prefix vector of weight j is denoted by ⍺ j(n) and possesses ones in the first k positions, where k is the lesser of j and n. The suffix vector ⍵ j(n) is defined analogously. Thus ∊2(3) = (0, 1, 0), ∊(4) = (1, 1, 1, 1), ⍺3(5) = (1, 1, 1, 0, 0), ⍵3(5) = (0, 0, 1, 1, 1), and ⍺7(5) = ⍺5(5) = (1, 1, 1, 1, 1). Moreover, ⍵ j(n) = j ↑ ⍺ j(n), and ⍺ j(n) = j ↓ ⍵ j(n). A logical vector of the form ⍺h(n) ∧ ⍵ j(n) is called an infix vector. An infix vector can also be specified in the form j ↓ ⍺k(n), which displays its weight and location more directly. An operation such as x ∧ y is defined only for compatible vectors x and y, that is, for vectors of like dimension. Since this compatibility requirement can be assumed to specify implicitly the dimension of one of the operands, elision of the parameter n may be permitted in the notation for the special vectors. Thus, if y = (3, 4, 5, 6, 7), the expression ∊ × y and ∊ j × y imply that the dimensions of ∊ and ∊ j are both 5. Moreover, elision of j will be permitted for the interval vector ⍳ j(n) (or ⍳ j), and for the residue operator | j when j is the index origin in use. It is, of course, necessary to specify the index origin in use at any given time. For example, the unit vector ∊3(5) is (0, 0, 1, 0, 0) in a 1-origin system and (0, 0, 0, 1, 0) in a 0-origin system, even though the definition (that is, (∊ j(n))k = (k = j)) remains unchanged. The prefix and suffix vectors are, of course, independent of the index origin. Unless otherwise specified, 1-origin indexing will be assumed. The vector ∊(0) is a vector of dimension zero and will be called the null vector. It should not be confused with the special null element ∘. where is any binary operator with a suitable domain. Thus +/x is the sum, ×/x is the product, and ∨/x is the logical sum of the components of a vector x. For example, ×/⍳1(5) = 1 × 2 × 3 × 4 × 5, ×/⍳1(n) = n!, and +/⍳1(n) = n(n + 1)/2. As a further example, De Morgan’s law may be expressed as ∧/u = , where u is a logical vector of dimension two. Moreover, a simple inductive argument (Exercise 1.10) shows that the foregoing expression is the valid generalization of De Morgan’s law for a logical vector u of arbitrary dimension. The parentheses now imply relational statements as well as grouping. The relational reductions of practical interest are ≠/u, and =/u, the exclusive-or and the equivalence reduction, respectively. a useful companion to De Morgan’s law. To complete the system it is essential to define the value of /∊(0), the reduction of the null vector of dimension zero, as the identity element of the operator or relation . Thus +/∊(0) = ∨/∊(0) = 0, and ×/∊(0) = ∧/∊(0) = 1.
and specifies a vector y of dimension μ(X) such that yi = /Xi. A column reduction of X is denoted by z ← //X and specifies a vector z of dimension ν(X) such that z j = //X j.
then +/U = (2, 2, 3), +//U = (2, 1, 3, 1), ∧//U = (0, 0, 1, 0), ≠/U = (0, 0, 1), =//U = (0, 1, 1, 1), and +/(=//U) = 3. The effective use of structured operands depends not only on generalized operations but also on the ability to specify and select certain elements or groups of elements. The selection of single elements can be indicated by indices, as in the expressions vi, M i, M j, and M i j. Since selection is a binary operation (i.e., to select or not to select), more general selection is conveniently specified by a logical vector, each unit component indicating selection of the corresponding component of the operand. , n–1) and +/(v/⍳1(n)) = (n/2)². It is clear that row compression suppresses columns corresponding to zeros of the logical vector and that column compression suppresses rows. This illustrates the type of confusion in nomenclature which is avoided by the convention adopted in Sec. 1.3: an operation is called a row operation if the underlying operation from which it is generalized is applied to the row vectors of the matrix, and a column operation if it is applied to columns. 1. the name, account number, and balance for each account with a balance less than two dollars. 2. the name, account number, and balance for each account with a negative balance exceeding one hundred dollars. 3. the name and account number of each account with a balance exceeding one thousand dollars. 4. all unassigned account numbers. , Lm, representing individual accounts. An unassigned account number is identified by the word “none” in the name position. The four output lists will be denoted by the matrices P, Q, R, and S, respectively. They can be produced by Program 1.9. L3k Balance of kth account. L2k Account number of kth account. L1k Name of kth account or “none” if account number L2k unused. Program 1.9. Since L3 is the vector of balances, and 2∊ is a compatible vector each of whose components equals two, the relational statement (L3 < 2∊) defines a logical vector having unit components corresponding to those accounts to be included in the list P. Consequently, the column compression of step 1 selects the appropriate rows of L to define P. Step 2 is similar, but step 3 incorporates an additional row compression by the compatible prefix vector ⍺² = (1,1,0) to select columns one and two of L. Step 4 represents the comparison of the name (in column L1) with the literal “none”, the selection of each row which shows agreement, and the suppression of all columns but the second. The expression “none ∊” occurring in step 4 illustrates the use of the extended definition of multiplication. Mesh operations on matrices are defined analogously, row mesh and column mesh being denoted by single and double reverse virgules, respectively. Catenation is clearly associative and for two vectors x and y it is a special case of the mesh \x, u, y\ in which u is a suffix vector. = \0, , x\ + \0, u, y\. x = \ /x + u\u/x. x = (0, x2, 0, x4, 0) + (x1, 0, x3, 0, x5). X = \\ //X + u\\u//X. c ← /a, u, b/ ↔ /c = /a, and u/c = u/b. \a, u, b\ = / \a, u, u\b/. Analogous relations hold for the row mask and row mesh and for the column mask and column mesh. U//A = (A12, A21, A22, A23, A33, A41, A51). Compression by the full matrix E (defined by = 0) produces either a row list (E/A) or a column list (E//A) of the matrix A. Moreover, a numerical matrix X can be represented jointly by the logical matrix U and the row list U/X (or the column list U//X), where U = (X ≠ 0). If the matrix X is sparse (i.e., the components are predominantly zero), this provides a compact representation which may reduce the computer storage required for X. The compression operations controlled by matrices also generate a group of corresponding mesh and mask operations as shown in Sec. S.9. The logical vector u involved in selection operations may itself arise in various ways. It may be a prefix vector ⍺ j, a suffix ⍵ j, or an infix (i ↓ ⍺ j); the corresponding compressed vectors ⍺ j/x, ⍵ j/x, and (i ↓ ⍺ j)/x are called a prefix, suffix, and infix of x, respectively. Certain selection vectors arise as functions of other vectors, e.g., the vector (x ≥ 0) can be used to select all nonnegative components of x, and (b ≠ *∊) serves to select all components of b which are not equal to the literal “*”. Two further types are important: the selection of the longest unbroken prefix (or suffix) of a given logical vector, and the selection of the set of distinct components occurring in a vector. The first is useful in left (or right) justification or in a corresponding compression intended to eliminate leading or trailing “filler components” of a vector (such as left zeros in a number or right spaces in a short name). where j is the maximum value for which ∧/(⍺ j/u) = 1. The maximum suffix is denoted by ⍵/u and is defined analogously. If, for example, u = (1, 1, 1, 0, 1, 1, 0, 0, 1, 1), then ⍺/u = (1, 1, 1, 0, 0, 0, 0, 0, 0, 0), ⍵/u = (0, 0, 0, 0, 0, 0, 0, 0, 1, 1), +/⍺/u = 3, and +/⍵/u = 2.
z ← (+/⍺/(x = 0)) ↑ x. A vector whose components are all distinct will be called an ordered set. The forward set selector on b is a logical vector denoted by σ/b and defined as follows: the statement v ← σ/b implies that vj = 1 if and only if bj differs from all preceding components of b. Hence v/b is a set which contains all distinct components of b, and +/v/⍳ is a minimum. For example, if c = (C, a, n, a, d, a), then (σ/c)/c = (C, a, n, d) is a list of the distinct letters in c in order of occurrence. Clearly (σ/b)/b = b if and only if b is a set. The backward set selector τ/b is defined analogously (e.g., (τ/c)/c = (C, n, d, a)). Forward and backward set selection are extended to matrices by both rows (σ/B, and τ/B) and columns (σ//B, and τ//B) in the established manner. (XY)j i = +/(X i × Yj). This formulation emphasizes the fact that matrix multiplication incorporates two elementary operations (+, ×) and suggests that they be displayed explicitly. The ordinary matrix product will therefore be written as X Y. (A ≠ 0) B = 4 6 . The generalized matrix product and the selection operations together provide an elegant formulation in several established areas of mathematics. A few examples will be chosen from two such areas, symbolic logic and matrix algebra. u//(X Y) = (u//X) Y. The first identity depends on the commutativity and associativity of the operator + and can clearly be generalized to other associative commutative operators, such as ∧, ∨, and ≠. z ← y x ↔ z = 1/(y 2 x). ⍺2(3) ⍺2(3) = 1 1 0 . For a vector x, either or will denote reversal of the order of the components. For ordinary matrix transposition (that is, ), the commonly used notation will also be employed. Certain of the special logical vectors introduced in Sec. 1.7 have useful analogs in logical matrices. Dimensions will again be indicated in parentheses (with the column dimension first) and may be elided whenever the dimension is determined by context. If not otherwise specified, a matrix is assumed to be square. Cases of obvious interest are the full matrix E(m × n), defined by (m × n) = 0, and the identity matrix I(m × n), defined by Iji = (i = j). More generally, superdiagonal matrices kI(m × n) are defined such that kIji(m × n) = (j = i + k), for k ≥ 0. Clearly 0I = I. Moreover, for square matrices, hI kI = (h + k)I.
the trace of a square numerical matrix X may be expressed as t = +/I/X. The triangular matrices are employed in the succeeding section. b2, b1, 1). More generally, x may represent a number in a mixed-radix system in which the successive radices (from high to low order) are the successive components of a radix vector y. + xν–1 y + xν . Z ← X Y ↔ Z j i = X i ⊥ Y j. In conventional treatments, such as Jacobson (1951) or Birkhoff and MacLane (1941), a set is defined as an unordered collection of distinct elements. A calculus of sets is then based on such elementary relations as set membership and on such elementary operations as set intersection and set union, none of which imply or depend on an ordering among members of a set. In the present context it is more fruitful to develop a calculus of ordered sets. A vector whose components are all distinct has been called (Sec. 1.10) an ordered set and (since no other types are to be considered) will hereafter be called a set. In order to provide a closed system, all of the “set operations” will, in fact, be defined on vectors. However, the operations will, in the special case of sets, be analogous to classical set operations. The following vectors, the first four of which are sets, will be used for illustration throughout. A variable z is a member of a vector x if z = xi for some i. Membership is denoted by z ε x. A vector x includes a vector y (denoted by either x ⊇ y or y ⊆ x) if each element yi is a member of x. If both x ⊇ y and x ⊆ y, then x and y are said to be similar. Similarity of x and y is denoted by x ≡ y. For example, t ⊆ s, t ⊆ r, t ⊆ a, a ⊆ t, t ≡ a, and t ≢ r. If x ⊆ y and x ≢ y, then x is strictly included in y. Strict inclusion is denoted by x ⊂ y.
u = ∊yx ↔ ν(u) = ν(y), and uj = (yj ε x). For example, ∊st = (0, 1, 1, 1, 0), ∊ts = (1, 1, 1), ∊sd = (1, 0, 0, 0, 1), ∊ds = (1, 0, 1, 0), and ∊nr = (1, 0, 1, 0, 1, 1). y ∩ x = ∊yx/y. For example, s ∩ d = (s, d), d ∩ s = (d, s), s ∩ r = (a, t, e, d), and r ∩ s = (e, d, d, a, t). Clearly, x ∩ y ≡ y ∩ x, although x ∩ y is not, in general, equal to y ∩ x, since the components may occur in a different order and may be repeated a different number of times. The vector x ∩ y is said to be ordered on x. Thus a is ordered on s. If x and y contain no common elements (that is, (x ∩ y) = ∊(0)), they are said to be disjoint. y ∆ x = yx/y. Hence y ∆ x is obtained from y by suppressing those components which belong to x. For example, st = (1, 0, 0, 0, 1) and s ∆ t = (s, d). Moreover, ts = (0, 0, 0) and t ∆ s = ∊(0). The union of y and x is denoted by y ∪ x and defined as follows:[d] y ∪ x = y (x ∆ y). For example, s ∪ d = (s, a, t, e, d, u, k), d ∪ s = (d, u, s, k, a, t, e), s ∪ a = s ∪ t = s, and n ∪ t = (n, o, n, s, e, t, a). In general, x ∪ y ≡ y ∪ x, and x ≡ (x ∩ y) ∪ (x ∆ y). If x and y are disjoint, their union is equivalent to their catenation, that is, x ∩ y = ∊(0) implies that x ∪ y = x y. In the foregoing development, the concepts of inclusion and similarity are equivalent to the concepts of inclusion and equality in the conventional treatment of (unordered) sets. The remaining definitions of intersection, difference, and union differ from the usual formulation in that the result of any of these operations on a pair of ordered sets is again an ordered set. With respect to similarity, these operations satisfy the same identities as do the analogous conventional set operations on unordered sets with respect to equality. (σ/b)/b ≡ (τ/b)/b ≡ b. Moreover, if f = (σ/x)/b, g = (σ/y)/y, and h = (σ/z)/z, then x = y ∩ z implies that f = g ∩ h, and x = y ∪ z implies that f = g ∪ h.
The unit vector ∊ j(n) will be recognized as a special case of the characteristic vector ∊yx in which x consists of the single component j, and y = ⍳h(n), where h is the index origin in use. In fact, the notation ∊ jih can be used to make explicit the index origin h assumed for ∊ j.
are a complete list of the vectors z belonging to the product set of x and y. The matrix A will be called the Cartesian product of x and y and will be denoted x y.
for all vectors k such that 1 ≤ ki ≤ di. Clearly, ν(A) = s, and μ(A) = ×/d. As illustrated by Table 1.11, the rows of the Cartesian product A are not distinct if any one of the vectors xi is not a set. then /X is the matrix of arguments of the truth table for three variables. The rank or index of an element c ε b is called the b index of c and is defined as the smallest value of i such that c = bi. To establish a closed system, the b index of any element a b will be defined as the null characer ∘. The b index of any element c will be denoted by b ⍳ c; if necessary, the index origin in use will be indicated by a subscript appended to the operator ⍳. Thus, if b = (a, p, e), b ⍳0 p = 1, and b ⍳1 p = 2.
k ← b ⍳ c ↔ k i = b ⍳ c i.
K ← B ⍳⍳ C ↔ Kj ← Bj ⍳ Cj. K ← b C ↔ Kj ← bj ⍳ Cj. , Cν with respect to the fixed vector b.
j = (ν(b)∊) ⊥ (b ⍳0 x). For example, if x = (c, a, b), then (b ⍳0 x) = (2, 0, 1), and j = 51.
, z) and k = (6, 5, 4), then c = (f, e, d). ∘ if m i ⍳1(ν(a)). where j-origin indexing is assumed for the vector a. For example, if a is the alphabet and m = (5, ∘, ∘, 4, 27, ∘, 3), then c = m ∫0 a = (f, ∘, ∘, e, ∘, ∘, d), and (c ≠ ∘∊)/c = (f, e, d). Moreover, m ∫2 a = (d, ∘, ∘, c, z, ∘, b). Elision of j is permitted. (m ≠ ∘∊)/(m ∫j b) = a ∩ b.
, t are vectors, each contained in b, then each can be represented jointly by the vector b and a mapping vector. If, for example, b is a glossary and p, q, etc. are texts, the total storage required for b and the mapping vectors might be considerably less than for the entire set of texts. Mapping may be shown to be associative, that is, m1 ∫i (m2 ∫j a) = (m1 ∫i m2) ∫j a. Mapping is not, in general, commutative. C ← M ∫∫h B ↔ Cj = Mj ∫h Bj. Row and column mappings are associative. A row mapping 1M and a column mapping 2M do not, in general, commute, but do if all rows of 1M agree (that is, 1M = ∊ p), and if all columns of 2M agree (that is, 2M = q ∊). The generalized matrix product is defined for the cases M A, and M a. A ← Bm ↔ Ai = Bmi. A vector k of dimension n is called a j-origin permutation vector if k ≡ ⍳j(n). A permutation vector used to map any set of the same dimension produces a reordering of the set without either repetition or suppression of elements, that is, k ∫j a ≡ a for any set a of dimension ν(k). For example, if a = (f, 4, *, 6, z), and k = (4, 2, 5, 1, 3), then k ∫1 a = (6, 4, z, f, *). If p is an h-origin permutation vector and q is any j-origin permutation vector of the same dimension, then q ∫j p is an h-origin permutation vector. the interval vector ⍳j(n) will also be called the j-origin identity permutation vector. If p and q are two j-origin permutation vectors of the same dimension n and if q ∫j p = ⍳j(n), then p ∫j q = ⍳j(n) also and p and q are said to be inverse permutations. If p is any j-origin permutation vector, then q = p ⍳j ⍳j is inverse to p.
The rotation operation k ↑ x is a special case of permutation. A function f which defines for each element bi of a set b a unique correspondent ak in a set a is called a mapping from b to a. If f(bi) = ak, the element bi is said to map into the element ak. If the elements f(bi) exhaust the set a, the function f is set to map b onto a. If b maps onto a and the elements f(bi) are all distinct, the mapping is said to be one-to-one or biunique. In this case, ν(a) = ν(b), and there exists an inverse mapping from a to b with the same correspondences. , ν(b), which may be described by a permutation vector j, such that ji = k. The selection of ji (step 4) then defines k, which, in turn, determines the selection of ak on step 5.
then j = (1, 3, 5, 2, 4). If b = “night”, then i = 5, ji = 4, and a = a4 = Nacht. If k is a permutation vector inverse to j, then Program 1.12b describes a mapping inverse to that of Program 1.12a. If j = (1, 3, 5, 2, 4), then k = (1, 4, 2, 5, 3). The inverse mapping can also be described in terms of j, as is done in Program 1.12c. The selection of the ith component of the permutation vector is then necessarily replaced by a scan of its components. Programs 1.12d and 1.12e show alternative formulations of Program 1.12a. a Set of correspondents in Programs (a, d, e) and set of arguments in Programs (b, c). b Set of arguments in Programs (a, d, e) and set of correspondents in Programs (b, c). j, k Mutually inverse permutation vectors. implies that k is a j-origin permutation vector, and that if y = k ∫j x, then either yi < yi+1 or yi = yi+1 and ki < ki+1. The resulting vector k is unique and preserves the original relative order among equal components. For example, if x = (7, 3, 5, 3), then θ1/x = (2, 4, 3, 1). The ordering operation is extended to arbitrary vectors by treating all nonnumeric quantities as equal and as greater than any numeric quantity. For example, if a = (7, ∘, 3,∘, 5, 3), then θ1/a = (3, 6, 5, 1, 2, 4), and if b is any vector with no numerical components, then θj/b = ⍳j(ν(b)). Ordering of a vector a with respect to a vector b is achieved by ordering the b-index of a. For example, if a = (e, a, s, t, 4, 7, t, h), and b is the alphabet, then m = b ⍳1 a = (5, 1, 19, 20, ∘, ∘, 20, 8) and θ1/m = (2, 1, 8, 3, 4, 7, 5, 6). The ordering operation is extended to matrices by the usual convention. If K = θj//A, then each column of the matrix B = K ∫∫j A is in ascending order. In determining the maximum m over components of a numerical vector x, it is often necessary to determine the indices of the maximum components as well. The maximization operator is therefore defined so as to determine a logical vector v such that v/x = m∊. Maximization over the entire vector x is denoted by ∊⌈x, and is defined as follows: if v = ∊⌈x, then there exists a quantity m such that v/x = m∊ and such that all components of /x are strictly less than m. The maximization is assumed by a single component of x if and only if +/v = 1. The actual value of the maximum is given by the first (or any) component of v/x. Moreover, the j-origin indices of the maximum components are the components of the vector v/⍳j. v ← u⌈x ↔ v = u\(∊⌈(u/x)). and if x = (2, –3, 7, –5, 4, –3, 6), then (x < 0) = (0, 1, 0, 1, 0, 1, 0), v = (0, 1, 0, 0, 0, 1, 0), v/x = (–3, –3), (v/x)1 = –3, and v/⍳1 = (2, 6). Minimization is defined analogously and is denoted by u⌊x. V ← u X ↔ Vj = u ⌈ Xj. is the highest ranking card in the hand. To every biunique[f] function f there corresponds an inverse function g such that g(f(x)) = x for each argument x in the domain of the function f. It is common practice either to introduce a distinct symbolism for the inverse function, as for the inverse functions of logarithm (logb x) and exponentiation (b³), or to use a superscript –1, as in sin–1x or f –1(x). specifies the variable x as the vector whose base two value is the number z.
determines x unambiguously as the vector (0, 2, 1, 18). b ← \ /b, u, a\. b ← /b, u, a/. Vectors and matrices are arrays which exhibit one level and two levels of structure, respectively. Although in certain fields, such as tensor analysis, it is convenient to define more general arrays whose rank specifies the number of levels of structure (i.e., zero for a scalar, one for a vector of scalars, two for a vector of vectors (matrix), three for a vector of matrices, etc. ), the notation will here be limited to the two levels provided by the matrix. [g] The present section will, however, indicate methods for removing this limitation. The only essential particularization to two levels occurs in the provision of single and double symbols (e.g. “/” and “//”, “⊥” and “ ”) for row and column operations, respectively, and in the use of superscripts and subscripts for denoting rows and columns, respectively. In applications requiring multiple levels, the former can be generalized by adjoining to the single symbol an index which specifies the coordinate (e.g. “/1” and “/2”, for row and for column compression, and, in general, “/j”.) The latter can be generalized by using a vector index subscript possessing one component index for each coordinate. The generalized notation can be made compatible with the present notation for vectors and matrices by adopting the name tensor and a symbol class (such as capital letters) for the general array of arbitrary rank. Detail can be subordinated in a more general manner by the use of subroutines. The name of one program appearing as a single statement in a second program implies execution of the named program at that point; the named program is called a subroutine of the second program. If, for example, “Cos” is the name of a program which specifies z as the cosine of the angle between the vectors x and y, then Program 1.13a uses the program “Cos” as a subroutine to determine r as the cosine of the angle between the vectors p and q. It is sometimes convenient to include the names of the arguments or results or both in the name of the subroutine as dummy variables. Thus if “Cos(x, y)” is the name of a subroutine which determines z as the cosine of the angle between x and y, then Program 1.13b uses Cos(x, y) as a subroutine to determine r as the cosine of the angle between p and q. Similarly, the program “z ← Cos(x, y)” can be used as in Program 1.13c to produce the same result. Many devices used for the storage of information impose certain restrictions upon its insertion or withdrawal. The items recorded on a magnetic tape, for example, may be read from the tape much more quickly in the order in which they appear physically on the tape than in some other prescribed order. Certain storage devices are also self-indexing in the sense that the item selected in the next read from the device will be determined by the current state or position of the device. The next item read from a magnetic tape, for example, is determined by the position in which the tape was left by the last preceding read operation. specifies x by the component xj, the auxiliary variable p by the succeeding partition pj+1, and stops the file in the position j + 1. The position of a file Φ will be denoted by π(Φ). Thus the statement j ← π(Φ) specifies j as the position of Φ, whereas π(Φ) ← j positions the file to j. In particular, π(Φ) ← 1 denotes the rewinding of the file and π(Φ) ← ν denotes winding, i.e. positioning to the extreme end of the file. Any file for which the general positioning operation π(Φ) ← j is to be avoided as impossible or inefficient is called a serial or serial-access file. , λν(λ), the partitions with larger indices normally demarking larger subgroups of components within the file. Thus if x were the row list of a matrix, the last component might be followed by the partition λ3, the last component of each of the preceding rows by λ2, and the remaining components by λ1. The auxiliary variable p specified by the partition symbol during the read of a file is normally used to control a subsequent branch. where p is the partition symbol recorded after the component xi. As in reading, each forward record operation increments the position of the file by one. A file which is only recorded during a process is called an output file of the process; a file which is only read is called an input file. Different files occurring in a process will be distinguished by righthand subscripts and superscripts, the latter being usually employed to denote major classes of files, such as input and output. , always omitting from the sequence any exhausted file. A partition λ2 is to be recorded with the last item recorded on Φ12, and all files are to be rewound. The process is described by Program 1.14. Φi1 Input files for i ε ⍳1(m). if and only if ui = 1.
b Item to be recorded. Program 1.14. Step 8 cycles k through the values 1 to m, and step 9 allows the read on steps 10 to occur only if uk = 0. The logical vector u is of dimension m and designates the set of exhausted files. Its kth component is set to unity by step 11 when file k is exhausted, as indicated by the occurrence of the partition λ2. Each read is normally followed by step 13, which records on the output file the item read. However, when the last file becomes exhausted, step 14 is executed instead to record the last item, together with the final partition λ2. Steps 1-6 initialize the parameters u and k and rewind all files. After the last item is recorded by step 14, the file rewinds are repeated before the final termination on step 7.
where the indicated branches depend on the value of the partition pj+1 which terminates the read. Thus the left or the right branch is taken according to whether pj+1 = λ1 or pj+1 = λ2. Certain files (such as the IBM 7090 tape files) permit only such “immediate” branching and do not permit the partition symbol to be stored for use in later operations, as was done in Program 1.14.
and if Φ is initially in position j + 1, then x = x j, p = p j, and the final position becomes j. Backward recording is defined analogously. The zero prescript may be omitted from the symbol 0Φ for both forward reading and recording. denotes the recording of the vector components x j on the file Φ j i together with partition p j for all j such that u j = 1. As for vectors and matrices, j-origin indexing may be used and will apply to the indexing of the file positions and the partition vector λ as well as to the array indices. However, the prescripts (denoting direction of read and record) are independent of index origin. 0-origin indexing is used in the following example. , 0, 1). In the next phase, the roles of input and output files are reversed, and the same process is performed on x1 and y1, that is, x2 = ⍺n/(\x1, u, y1\) and y2 = ⍵n/(\x1, u, y1\) are recorded on Φ00 and Φ10, respectively. The process is to be continued through m phases. Φ File array of dimension 2 × 2; original input Φ0; original output Φ1. u0 Column index of input file. u1 Column index of output file. u2 Row index of current input file, and direction of read and record. n Number of items per file. m Required number of merges. Program 1.15. The program for Example 1.4 begins with the rewind of the entire 2 × 2 array of files. To obviate further rewinding, the second (and each subsequent even-numbered) execution is performed by reading and recording all files in the backward direction. Step 6 performs the essential read and record operation under control of the logical vector u, whose components u0, u1, u2 determine, respectively, the subscript of the file to be read, the subscript of the file to be recorded, and the direction of read and record. The file superscripts (determining which classes serve as input and output in the current repetition) are also determined by u2, the input being u2 and the output 2. The loop 6-8 copies n items, alternating the input files through the negation of u0 on step 7. When the loop terminates, u1 is negated to interchange the outputs, and the loop is repeated unless u1 = u2. Equality occurs and causes a branch to step 3 if and only if all 2n items of the current phase have already been copied. Not all computer files have the very general capabilities indicated by the present notation. Some files, for example, can be read and recorded in the forward direction only and, except for rewind, cannot be positioned directly. Positioning to an arbitrary position k must then be performed by a rewind and a succession of (k – 1) reads. In some files, recording can be performed in the forward direction only, and the positions are defined only by the recorded data. Consequently, recording in position k makes unreliable the data in all subsequent positions, and recording must always proceed through all successive positions until terminated. For many processes it is convenient to use a structured operand with the treelike structure suggested by Fig. 1.16. It is helpful to begin with a more general structure (such as Fig. 1.17) in which a unidirectional association may be specified between any pair of its components. A directed graph comprises a vector n and an arbitrary set of unilateral associations specified between pairs of its components. The vector n is called a node vector and its components are also called nodes. The associations are conveniently specified by a (logical) connection matrix U of dimensions ν(n) × μ(n) with the following convention: there is an association, called a branch, from node i to node j if and only if U j i = 1. A directed graph admits of a simple graphical interpretation, as illustrated by Fig. 1.17. The nodes might, for example, represent places, and the lines, connecting streets. A two-way street is then represented by a pair of oppositely directed lines, as shown between nodes 3 and 4. Figure 1.17 A graphical representation of the graph (n, U). then the vector p = k ∫ n is called a path vector of the graph (n, U). The dimension of a path vector is also called its length. Nodes k1 and kν are called the initial and final nodes, respectively; both are also called terminal nodes. If j is any infix of k, then q = j ∫ n is also a path. It is called a subpath of p and is said to be contained in p. If ν(q) < ν(p), then q is a proper subpath of p. If k1 = kν and p = k ∫ n is a path of a length exceeding one, p is called a circuit. For example, if k = (6, 1, 7, 7, 2, 6, 1, 5), then p = (n6, n1, n7, n7, n2, n6, n1, n5) is a path vector of the graph of Fig. 1.17, which contains the proper subpaths (n7, n2, n6), (n1, n7, n7, n2, n6, n1), and (n7, n7), the last two of which are circuits. Node j is said to be reachable from node i if there exists a path from node i to node j. A graph (such as Fig. 1.16) which contains no circuits and which has at most one branch entering each node is called a tree. Since each node is entered by at most one branch, a path existing between any two nodes in a tree is unique, and the length of path is also unique. Moreover, if any two paths have the same final node, one is a subpath of the other. Since a tree contains no circuits, the length of path in a finite tree is bounded. There therefore exist maximal paths which are proper subpaths of no longer paths. The initial and final nodes of a maximal path are called a root and leaf of the tree, respectively. A root is said to lie on the first level of the tree, and, in general, a node which lies at the end of a path of length j from a root, lies in the jth level of the tree. A tree which contains n roots is said to be n-tuply rooted. The sets of nodes reachable from each of the several roots are disjoint, for if any node is reachable by paths from each of two disjoint roots, one is a proper subpath of the other and is therefore not maximal. Similarly, any node of a tree defines a subtree of which it is the root, consisting of itself and all nodes reachable from it, with the same associations as the parent tree. If for each level j, a simple ordering is assigned to each of the disjoint sets of nodes reachable from each node of the preceding level, and if the roots are also simply ordered, the tree is said to be ordered. Attention will henceforth be restricted to ordered trees, which will be denoted by uppercase boldface roman characters. The height of a tree T is defined as the length of the longest path in T and is denoted by ν(T). The number of nodes on level j is called the moment of level j and is denoted by μj(T). The vector μ(T) is called the moment vector. The total number of nodes in T is called the moment of T and is denoted by μ(T). Clearly, ν(μ(T)) = ν(T), and +/μ(T) = μ(T) = ν(n). The number of roots is equal to μ1(T), and the number of leaves will be denoted by λ(T). , ν(T), νj(T) is equal to the maximum over the branching ratios of the nodes on level j – 1. For the tree of Fig. 1.16, ν(T) = (3, 3, 4, 3, 2). The number of roots possessed by a tree T (that is, ν1(T)) is called its dispersion. A tree possessing unity dispersion is called rooted or singular. Each node ni of a graph (and hence of a tree) may be identified by its index i. Since a tree admits of more convenient index vectors, the underlying index i will henceforth be referred to as the graph index. In an ordered tree, any path of length k from a root can be uniquely specified by an index vector i of dimension k, where i1 specifies the particular root, and the remaining components specify the (unique) path as follows: the path node on level j is the ij th element of the set of nodes on level j reachable from the path node on level j – 1. The node at the end of the path can therefore be designated uniquely by the index vector i. The degree of node i will be denoted by δ(i, T). The index vectors are shown to the left of each node in Fig. 1.16. The path from a root whose terminal node is i will be denoted by Ti. In Fig. 1.16, for example, Ti = (n2, n8, n13, n24) if i = (2, 2, 2, 3). A vector i is said to be an index of T if it is the index of some node in T.
The subtree of T rooted in node i will be denoted by Ti. Thus in Fig. 1.16, P = T(2,2,2) is a rooted subtree with ν(P) = (1, 3, 2), and μ(P) = (1, 3, 3). A path in Ti is denoted by (Ti) j. For example, if G is an ascending genealogical tree[h] with the sword and distaff sides denoted by the indices 1 and 2, respectively, then any individual x and the nearest (n – 1) paternal male ancestors are represented by the path vector (Gi)∊(n), where i is the index of x in G.
i Path index vector to be determined. μ1(T) Number of roots of T.
δ(i,T) Degree of node i. Program 1.18. The index vector i specifies the path currently under test. Its last component is incremented repeatedly by step 7 until the loop 6-8 is terminated. If the path Ti agrees with the corresponding prefix of the argument x, termination occurs through the branch to step 9, which tests for completion before step 10 augments i by a final zero component. Step 5 then respecifies d as the degree of the penultimate node of the set of d paths next to be tested by the loop. Termination by a branch from step 6 to step 2 occurs if all d possible paths are exhausted without finding agreement on step 8. In this event, retraction by one level occurs on step 2, and d is again respecified. If ν(i) = 1, the paths to be searched comprise the roots of the tree and d must therefore be specified as the number of roots. This is achieved by executing step 3 and skipping step 5. Retraction to a vector i of dimension zero occurs only if all roots have been exhausted, and final termination from step 4 indicates that the tree possesses no path equal to the argument x. Moreover, if n is itself the alphabet (that is, n = (a, b, c, ... , z)), then the vector n′ of Table 1.19a is a permutation of n, and d′ is the associated degree vector. Table 1.19b shows another such pair, n′′ and d′′. The degree vector provides certain useful information most directly. For example, since each leaf is of degree zero, λ(T) = +/(d = 0). Moreover, the number of roots is equal to the number of nodes less the total of the degrees, that is, μ1(T) = ν(d) – +/d, and the maximal degree occurring in T is given by δ(T) = ((∊⌈d)/d)1. Finally, the degree vector and the node vector together can, in certain permutations (those of Table 1.19), provide a complete and compact description of the tree. If each one of the μ(T) index vectors i of a tree T is listed together with its associated node (Ti)ν(i), the list determines the tree completely. Since the index vectors are, in general, of different dimensions, it is convenient to append null components[i] to extend each to the common maximum dimension ν(T). They may then be combined in an index matrix of dimension μ(T) × ν(T), which, together with the associated node vector, completely describes the tree. If, for example, the node vector n is the alphabet, the tree of Fig. 1.16 is described by the node vector n′ and index matrix I ′ of Table 1.19a or, alternatively, by n′′ and I ′′ of Table 1.19b. Because of the utility of the degree vector, it will be annexed to the array of node vector and index matrix, as shown in Table 1.19a to form a full list matrix of the tree. The degree vector and node vector together will be called a list matrix. As remarked, the list matrix can in certain permutations, alone describe the tree. Formally, the full list matrix M of a tree T is defined as follows: 2/M is an index matrix of the tree, M1 is the associated degree vector, and M2 is the associated node vector. Thus for each k ε ⍳1(μ(T)), M1k = δ(i, T), and M2k = (Ti)ν(i), where i is the nonnull portion of 2/M k, that is, i = (( 2/Mk) ≠ ∘∊)/( 2/Mk). The corresponding list matrix is ⍺2/M. Since a full list matrix provides a complete description of a tree regardless of the order in which the nodes occur in the list, any column permutation M p (that is, any reordering among the rows) is also a full list matrix. Two particular arrangements of the full list matrix are of prime interest because each possesses the following properties: (1) the nodes are grouped in useful ways, and (2) the list matrix (i.e., the degree vector and node vector) alone describes the tree without reference to the associated index matrix. They are called the full left list matrix and full right list matrix and are denoted by [T and ]T, respectively. Table 1.19 shows the full left and full right lists of the tree of Fig. 1.16. The right list matrix is right justified and is ordered on the same function, namely (ν(a)∊) ⊥ (a ⍳0 I j). The rows are therefore ordered on their values as integers, i.e., with the decimal point at the right. From the example of Table 1.19b it is clear that the right list groups the nodes by levels, i.e., level j is represented by the infix (i ↓ ⍺k)//(]T), where k = μj(T), and i = +/⍺j–1/μ(T). In Table 1.19b, for example, μ(T) = (3, 7, 8, 5, 3), and if j = 3, then k = 8, i = 10, and level j is represented by rows i + 1 = 11 to i + k = 18. The right list is therefore useful in executing processes (such as the pth degree selection sort) which require a scan of successive levels of the tree. The left list groups the nodes by subtrees, i.e., any node i is followed immediately by the remaining nodes of its subtree Ti. Formally, if I = 2/[T, and if i = (I k ≠ ∘∊)/I k, then the tree Ti is represented by the infix ((k – 1) ↓ ⍺ μ(Ti))//[T. In Fig. 1.19a, for example, if k = 16, then i = (2, 2, 2), μ(Ti) = 7, and Ti is represented by rows 16 to 22 of [T. The left list is therefore useful in processes (such as the construction of a Huffman code and the evaluation of a compound statement) which require a treatment of successive subtrees. The row index of a node in a right (left) list matrix is a graph index of the node and will be called the right (left) list index. A two-column matrix which forms the right list of some tree is said to be a well formed right list. Since the ordering of the nodes in a right list of a given tree is unique, the right list of a given tree is unique. Conversely, any well formed right list specifies a unique tree according to the algorithm of Program 1.20. Identical remarks apply to the left list, except that Program 1.20 is replaced by Program 1.21. Moreover, the necessary and sufficient conditions for the well formation of a left list are identical with those for a right list and are derived by virtually identical arguments. The case will be stated for the right list only. must be strictly positive. The condition is also sufficient. implies that s2 ≥ R11, and the number of roots possessed by G therefore fulfills the number of branches required by the added node R21. A legitimate tree corresponding to R can therefore be formed by joining the last R11 roots of G to the node R21. Tests for well formation can therefore be incorporated in any algorithm defined on a right or left list matrix M by computing the components of the suffix dispersion vector s. The recursion si–1 = si + 1 – M1i–1 is convenient in a backward scan of M, and the equivalent recursion si = si–1 – 1 + M1i–1 serves for a forward scan. The starting condition for a forward scan is s1 = ν(M1) – (+/M1), and for a backward scan is sν = 1 – M1μ. Since the criteria of well formation are identical for right and left lists, a matrix may be characterized simply as well or ill formed. sj+1 = (+/ j/g), or s = (I + ) /g. The complete determination of the tree corresponding to a given list matrix M is best described as the determination of the associated index matrix I. For both left and right lists this can be achieved by a single forward scan of the rows of M and of I. For a right list R it is first necessary to determine r, the number of roots. The first r components of R are then the roots of the tree in order, the next R11 components of R are the second-level nodes reachable from the first root, and so forth. Programs 1.20 and 1.21 describe the processes for a right list and a left list, respectively. R Right list of T.
I Right index matrix of T.
i Index of row of R currently examined. j Right list index of node reachable from node i.
φ Origin with respect to which I is finally expressed. , and each must be prefixed by the index vector of node i. This assignment is effected by the vector v, which is initialized by the index vector of node i rotated left by one (step 11), and which is incremented by step 15 before each assignment occurring on step 16. At the outset, v is set to zero and d is set to the number of roots as determined by step 4. Since j is, at step 10, equal to the current number of roots r augmented by the cumulative degrees of the first i – 1 nodes, then r = j – i + 1 and the exit on step 10 therefore occurs always and only in the event of ill formation. Alternatively, the test can be viewed as an assurance that each row of the matrix I is specified before it is itself used in specification. When step 5 is first reached, the index matrix I is complete but is expressed in 1-origin indexing with zeros representing the null elements. Steps 5-7 translate the matrix to the origin φ and mask in the necessary null elements. L Right list of T.
I Left index matrix of T.
j Index of row of I currently determined. i Left list index of path node j in current path (step 16), or index of last previous node whose branches remain unexhausted (step 22). ci+1 Index of node following node i in the last path traced from i.
r Pararmeter for testing well formation. φ Origin with respect to which I is expressed. Program 1.21. The index vectors I j are determined in order under control of the parameter. The loop 5-18 traces a continuous path through the tree, determining the index of each successive node of the path by rotating the index of the preceding node (step 17) and adding one to the last component (step 13), and maintaining in the connection vector c a record ci+1 of the index j of the successor of node i in the path traced. The path is interrupted by the occurrence of a leaf (that is, L1j = 0 on step 18), and the degree vector L1 is then scanned by the loop (19-20) to determine the index i of the last preceding node whose branches remain incompleted. Steps 22-23 then respecify v as the index vector of the node following node i in the path last traced, and step 21 decrements the component L1i of the degree vector. The branch from step 19 to step 22 occurs at the completion of each rooted subtree. The test for well formation (step 12) is the same as that applied to the right list in Program 1.20, except that the notation for the relevant parameters differs. The concluding operations (6-9) include left justification on step 7.
, 226, are all on the same level of P although they have been shown with branches of different lengths to permit easy identification with the nodes of the original tree T.
The compress operation is best executed on the left list because of the grouping by subtrees. Program 1.23 gives a suitable algorithm which also serves as a formal definition of the compress operation. u Left node vector of U.
L Left list of T.
j Index of first zero of u (steps 4-8). Index of root of smallest subtree containing deleted node (step 12). d Change of degree caused by deletion of j.
r Number of roots indicated by infix (⍺ j ∧ k)//L, where j is initial value and k + 1 is current value of j. Program 1.23. The vector u is specified as the node vector of the left list of the controlling logical tree U and controls the subsequent process. Step 4 determines j as the index of the first zero component of u. Steps 6 and 7 then delete the corresponding nodes of u and of the left list of T, but only after step 5 has determined d as the change in degree which this deletion will occasion to the root of the smallest subtree containing the deleted node. Steps 9-11 perform a backward scan of the degree vector to determine j as the index of the root of the subtree, and step 12 effects the requisite change in its degree. The exit on step 9 occurs only if the node deleted is a root of the original tree, in which event no change is produced in the degree of any other node. and P is obtained from T by deleting each rooted subtree Ti for which u i = 0. Path compression by a unit vector ∊ j produces a tree of height one. Such a tree is, in effect, a vector and will be treated as one. Two related special logical trees are defined: the path tree uE such that / uE = 0 and u/ uE is the full tree E whose nodes are all unity, and the level tree uE such that //uE = 0, and u//uE = E.
specifies M as a tree (of the same structure as T) such that node i of M is the j-origin b-index of node i of T.
implies that μ1(P) = ν(m), that Pi is a single null character if mi ∉ ⍳j(μ1(T)), and otherwise Pi = Tm, where j-origin indexing is used for T.
The notation //T will denote the application of the binary operator or relation to the nodes of T in right list order (i.e., down successive levels) and /T will denote the same application in left list order (i.e., across paths). If the operator is symmetric (i.e., its operands commute), then //T = /T. Maximization (U⌈T) and minimization (U⌊T) are extended to trees in the obvious way. implies that V is obtained from U by setting to zero every node whose subtree contains a zero node. The definitions of σ/U and τ/U are analogous. If, for all j, every node on level j of a tree T is either of degree zero or of degree ν j+1(T), then the tree T is said to be uniform. If all leaves of a uniform tree T lie in the same level (necessarily the top), then the tree is said to be homogeneous. The structure of a homogeneous tree is completely characterized by its dispersion vector ν(T)). All maximal paths in a homogeneous tree are clearly of the same length, namely ν(T) = ν(ν(T)). Figure 1.25 shows a homogeneous tree and its associated dispersion vector. A tree T for which ν(T) = m∊ is called an m-way tree, and a tree for which ν1(T) = 1 and 1/ν(T) = m∊ is called a singular m-way tree. The jth component of the moment vector of a homogeneous tree is clearly equal to the product of the first j components of the dispersion vector, that is, μ(T) = ( + I) ν(T)). The dispersion vector is, in turn, uniquely determined by the moment vector. The total number of nodes is given by μ(T) = +/μ(T), and it can also be shown that μ(T) = y ⊥ y, where y is the dispersion vector in reverse order. Tree compression of a homogeneous tree H (that is, U/H) does not generally produce a homogeneous tree, and, in fact, any tree P of arbitrary structure can be represented by a pair of homogeneous trees U and H such that P = U/H. On the other hand, both path and level compression of homogeneous trees produce homogeneous trees. Moreover, if P = u/H, then ν(P) = u/ν(H), and if P = u//H, then ν(P) = ν(H) – (+/ )⍺1. Since the structure of a homogeneous tree is completely specified by its dispersion vector k, the structure of the special logical trees can be specified in the forms E(k), uE(k), and uE(k). In a homogeneous tree, the right list or left list index of a node can be determined as an explicit function of its index vector. Conversely, the index vector i can be determined directly from the corresponding left list index, to be denoted by l(i), or from the right list index r(i). In developing the relations between indices it will be convenient to use 0-origin indexing throughout. is the rank of node i in the ν(i)th level. For example, if i = (1, 0, 1) in the tree of Fig. 1.25, then μ(H) = (2, 6, 12), f(i) = +/(2, 6) = 8, and g(i) = (2, 3, 2) ⊥ (1, 0, 1) = 7. (⍺ν(i)/ν(T)) ⊥ i = r – f(i). g(j) = g(i) × (ν(T))ν(i) + jν–1. r(j) = m × r(i) + 1 + jν–1. The left list index l(i) is most conveniently expressed as a function of ν(i) and of the vector z(i) (zero extension of i), where z = ⍺ν(i)(ν(T))\ i. Clearly ν(z) = ν(T) and z is the index of the “earliest” leaf reachable from node i. In Fig. 1.25, for example, z((1, 2)) = (1,2,0). The zero extension has the obvious property that every node above the path T z(i) precedes node i in the left list, and every node below the path follows it. The number of nodes in the path which precede node i is ν(i) – 1.
l(i) = ν(i) – 1 + (⍺ j/ν(T)) ⊥ (⍺ j/z(i)). where wν = 1, and wi–1 = 1 + (wi × νi(T)). In the foregoing example, w = (10, 3, 1), and w z(i) = 10. This form is most convenient for determining i as a function of l, for since w z = l + 1 – ν(i), then z 0(i) = ⌊l ÷ w0⌋, z 1(i) = ⌊((w0 | l) – 1) ÷ w1⌋, etc. for all positive values of the quotient, and all components thereafter are zero. The dimension ν(i) is then determined from the relation ν(i) = l + 1 – w z(i).  Birkhoff, G., and S. MacLane (1941), A Survey of Modern Algebra, Macmillian, New York.  Burks, A.W., D.W. Warren, and J.B. Wright (1954), “An Analysis of a Logical Machine Using Parenthesis-free Notation”, Mathematical Tables and Other Aids to Computation, vol. VIII, pp. 53-57.  Dickson, L.E. (1939), New First Course in the Theory of Equations, Wiley, New York.  Garner, Harvey L. (1959), “The Residue Number System”, IRE Transactions, vol. EC-8, pp. 140-147.  Goldstine, H.H., and J. von Neumann (1947), “Planning and Coding of Problems for an Electronic Computing Instrument”, Report on the Mathematical and Logical Aspects of an Electronic Computing Instrument, Part II, vol. 1, Institute for Advanced Study, Princeton.  Iverson, K.E. (1954), “Machine Solutions of Linear Differential Equations”, Doctoral Thesis, Harvard University.  Jacobson, N. (1951), Lectures in Abstract Algebra, vol. 1, Van Nostrand, New York.  Kunz, K.S. (1957), Numerical Analysis, McGraw-Hill, New York.  Margenau, H., and G.M. Murphy (1943), The Mathematics of Physics and Chemistry, Van Nostrand, New York.  Phister, M. (1958), Logical Design of Digital Computers, Wiley, New York.  Richards, R.K. (1955), Arithmetic Operations in Digital Computers, Van Nostrand, New York.  Riordan, J. (1958), An Introduction to Combinatorial Analysis, Wiley, New York.  Rutishauser, H. (1959), “Zur Matrizeninversion nach Gauss-Jordan”, Zeitschrift für Angewandte Mathematik und Physik, vol. X, pp. 281-291.  Wright, H.N. (1939), First Course in Theory of Numbers, Wiley, New York. a. Restating the relation in terms of the 0-residue will illustrate the convenience of the 1-residue used here. b. Since each “vector” yi 2 xj is of dimension one, no scan operator 1 is required, and the symbol ∘ may be interpreted as a “null” scan. c. These transpositions generate the rotation group of the square [cf. Birkhoff and MacLane (1941) Chap. VI]. A pair of transpositions commute if and only if their axes are perpendicular. Hence the pair ← and ↑ may be written unambiguously as . Moreover, = . The remaining two transformations can be denoted by and , with the convention that the operator nearest the operand (i.e., the horizontal) is executed first. d. The symbols ∪ and ∩ (and the operations they denote) are commonly called cup and cap, respectively. e. For the purposes of describing algorithms, this notation is superior to the classical “disjoint cycles” notation for permutations [cf. Birkhoff and MacLane, (1941)] because (1) the direction of the transformation (from a to c) is unequivocally indicated, and (2) the notation directly indicates a straightforward and efficient method for the actual execution, namely, indirect addressing. f. If the function f is many-to-one, the specification of a unique inverse g is achieved by restricting the range of g to some set of “principal” values, as is done, for example, for the inverse trigonometric functions. , nM, or families of families j iM. h. Although such a genealogical tree is not necessarily a tree in the mathematical sense, it will be assumed so for present purposes. i. In the 1-origin indexing system used here it would be possible to use the numeric zero to represent the null. In 0-origin indexing, however, zeros occur as components of index vectors and must be distinguishable from the nulls used. j. The term left list and the notation [T are both intended to suggest left justification. Organize each of the programs according to the method of leading decisions. Except where otherwise indicated, use 1-origin indexing. The conventions of Sec. S.1 of the Summary of Notation will be used in the statement of each of the exercises. (a) the dimensions ν(d), ν(s), and ν(x). (b) the vectors x + y, x – y, x × y, x ÷ y, and u + v.
(c) the logical vectors u ∧ v, u ∨ v, (u ≠ v), and (u = v). (d) the reductions +/x, ×/y, ∧/u, and ∨/v. (e) the base two values of u and of v, that is, +/(x × u), and +/(x × v). (f) the rotated vectors 2 ↓ d, 4 ↑ s, and ↑ y. (g) the unit vectors ∊1(5) in a 1-origin system, and ∊2(5) in a 0-origin system. (f) the infixes (⍺5(7) ∧ ⍵5(7)) and 2 ↓ ⍺3(7). (b) +/⍳ j(n) = n(n + 2j – 1) ÷ 2. (c) ×/(k ↑ x) = ×/x. (d) (k ↑ x) + (k ↑ y) = k ↑ (x + y). 1.3 Write detailed (i.e., component-by-component) programs for the following operations. Include tests for compatibility of the operands. (a) w ← u ∧ v.
(b) W ← U ∨ V.
(f) x ← (x > 0)/x. (g) u ← ⍺ j(k). (h) u ← i ↓ ⍺ j(k). (i) c ← \a, u, b\. (j) c ← /a, u, b/. (a) /a, u, b/ = \ /a, u, u/b\. (b) \a, u, b\ = / \a, u, u\b/. (i) ring n may be placed on or removed at will. (ii) ring k may be placed on or removed only if ring (k + 1) is on and all succeeding rings are off. (a) the excess-three code for decimal digits. (b) any chosen two-out-of-five code. (c) any chosen biquinary code. (a) r, c, and U. (b) ⌊⌊ a ÷ b⌋ ÷ c⌋ = ⌊ a ÷ bc⌋ for all positive integers a, b, and c.
(a) h as a function of k, ν(A), and μ(A). (b) k as a function of h, ν(A), and μ(A). (c) the permutation vector h such that c = h ∫ r.
(e) U v = (2∊) |0 (U v). (f) U V = . (g) (t u) ∧ (v w) = (t w) ∧ (v u). (b) What properties are required of an operator that it satisfy the relation established for + in part (a)? (a) X Y = ( /X) ( //Y) + (u/X) (u//Y). (b) u/(X Y) = X (u/Y). (c) u//(X Y) = (u//X) Y. (d) (u ∧ v)/a = (u/v)/(u/a). 1.13 Use the result of Exercise 1.11 (b) to extend the results of Exercise 1.12 (a-c) to logical operators. (a) the value of the polynomial x at the point a, that is, to evaluate (y∊) ⊥ x for y = a. Use no more than ν(x) multiplications. (y∊) ⊥ z = ((y∊) ⊥ x), and ν(z) = ν(x). (a∊) ⊥ z = b. (d) the quotient q and remainder r obtained in dividing the polynomial n by the polynomial d, for ν(d) ≤ ν(n). (e) the value of the polynomial n at the point a by using part (d) with d = (1, –a). (f) the value of ((y∊) ⊥ n) at the point a by two applications of part (e). (g) an approximate real root of the equation (y∊) ⊥ x = 0 using parts (e) and (f) and the Newton-Raphson formula [Kunz (1957)]. (b) determine x as a function of r.
1.17 Write a program to determine the moduli of all roots of the polynomial x, using the Graeffe method [Kunz (1957)]. Assume that operations for the logarithm and exponential functions are available as subroutines. 1.18 List all the 1-origin permutation vectors of dimension four which are self-inverse. (a) the permutation k which is inverse to the permutation j. (b) a permutation j which transforms a given logical vector u to a prefix vector. (a) the permutation matrix U corresponding to the 1-origin permutation vector k, that is, determine U such that U x = k ∫1 x. (b) the permutation k corresponding to a given permutation matrix U. (c) the permutation V which is inverse to the permutation U. 1.21 Let p be the vector representation of a permutation and let c be the standard representation in terms of disjoint cycles, including all cycles of one [Jacobson (1951), p. 34]. Each cycle of c is enclosed in square brackets, each half-bracket being considered as a component of c. For example, c = ([, 1, 3, 5, ], [, 2, 4, ], [, 6, ]), then p = (3, 4, 5, 2, 1, 6), ν(p) = 6, and, in general, ν(c) = ν(p) + 2k where k is the number of disjoint cycles in p. The usual elision of cycles of one would give c = ([, 1, 3, 5, ], [, 2, 4, ]), but this determines a unique correspondent p only if the dimension of p is otherwise specified, and inclusion of all cycles of one will therefore be assumed. If each infix of numerical components in c is preceded by a left bracket and followed by a right bracket, and if c determines a legitimate permutation vector p, then c is said to be well formed. (a) Write a program to determine p as a function of a well formed permutation c. Include determination of the dimension of p.
(b) Modify the program in part (a) to incorporate checks on the well formation of c. If c is ill formed, the vector p is to be defined as the literal “ill formed”. c r (∘,∘). Include checks on the well formation of each permutation. (d) Write a program to determine the parity [Jacobson (1951), p. 36] of a permutation vector p.
(a) Copy onto file Φ12 successive groups of items from the row of files Φ⍳ in cyclic order, omitting any exhausted files. The end of each group is demarked by a partition λ2, and the end of each file by a partition λ3. (b) A file which is always recorded in the forward direction and read in the backward direction functions as a stack. Using file Φ22 as a stack, modify the program of part (a) so as to reverse (in the output file Φ12) the order of the items within each group. 1.24 The accompanying node vector n and connecting matrix C together specify a directed graph (C j i = 1 indicates a branch from node i to node j) which is, in fact, a tree. (a) Draw one of the possible ordered trees represented by n and C.
(b) For the tree T of part (a) show the full left list [T.
(c) Show the full right list ]T.
(a) Give an example of a well formed right list which demonstrates that a prefix of a right list is not, in general, well formed. (b) Show clearly where the argument used in establishing the well formation of any suffix of a well formed list breaks down when applied to a prefix. (a) a left list groups nodes by subtrees. (b) a right list groups nodes by levels. (c) μ1(T) = ν(d) – +/d, where d is the degree vector of T.
(a) the left list degree vector of T.
(b) the right list degree vector of T.
1.29 Trace Programs 1.20 and 1.21 for the tree of Exercise 1.24. 1.30 Show that for a homogeneous tree H, μ(H) = y ⊥ y, where = ν(H). (a) the left list index l(i). (b) the right list index r(i). (c) the index j of the node whose left list index is 27. (a) If K = ⍳0(n) ↓ (∊(n) ⍳0(n)), show that K + = n(E – I). (b) If y is any permutation of x and ν(x) = n, show that x K x = y K y. (a) d as the greatest common divisor of positive integers x and y. (b) d as the g.c.d. of x and y, where d, x, and y represent polynomials in z (e.g., ((z∊) ⊥ x). 1.34 To assure uniqueness, the number of different digits (symbols) used in a base b number system must not exceed b. The limitation to the particular range 0 ≤ a i < b is, however, not essential. For example, a base three system can be constructed using digits –1, 0, and 1, for which it is convenient to adopt the symbols –, 0, and +, respectively. The positive numbers beginning at zero are then represented by the sequence 0, +, + –, +0, + +, + – –, + –0, + – +, + 0 –, +00, etc. The negative numbers beginning at 0 are 0, –, – +, –0, – –, – + +, – +0, – + –, –0 +, –00, etc. (a) Construct addition and multiplication tables for this number system and calculate the sum and the product of the numbers 0 – and – –. Use the decimal system to check all results. (b) Negative numbers are represented in this system without the attachment of a special sign position. Special rules regarding sing are therefore banished except that it is necesssary to formulate a rule for changing the sign of a number, i.e. to multiply by minus one. Formulate such a rule. 1.35 For any integer n, let x2 = 2 |0 n, x3 = 3 |0 n, x5 = 5 |0 n, and x7 = 7 |0 n. As shown by Garner (1959), the ordered array (x2, x3, x5, x7) provides a representation of the integer n in a so-called residue number system. (a) Write the residue representations of the first ten nonnegative integers. (1) that the representation is unique. (c) Discuss the choice of moduli for extending the range of the representation. (d) Show that the algorithm derived in part (b) is valid for all positive and negative integers in the range –a/2 ≤ n < a/2 for a = 2 × 3 × 5 × 7. (e) Derive an algorithm for obtaining –n from n.
(f) Derive an algorithm for multiplication. (g) The sign of the number (i.e., its relation to zero) is not displayed directly by this representation. Convince yourself that its determination is nontrivial. (c) the +, –, 0 base three system (of Exercise 1.34). (d) the residue number system (of Exercise 1.35). 1.37 Write programs for the multiplication z = x × y for each of the cases of Exercise 1.36. (a) base b1 and b2. (b) base b1 and b2. (c) base three and the +, –, 0 base three of Exercise 1.34. (d) residue and base b (Exercise 1.35). (a) Show that the superdiagonal matrices satisfy jI kI = (j+k)I. (b) A matrix of the form J = (xI + 1I) is called a Jordan box. Write the expansion of the nth power of J. (d) Determine an explicit solution to the set of linear equations A x = y, where u/x = a and v/y = b are known and where +/u + +/v = ν(A) = μ(A). State the conditions for the existence of a unique solution. 1.40 Any nonsingular matrix A can be reduced to the identity I by a sequence of row operations of the form Ai ← xAi + yAi, or Ai ← A j. The process which accomplishes this (using row operations only) by reducing successive column vectors to the successive unit vectors is called Jordan or complete elimination. If the same sequence of row operations is executed upon the identity matrix, it will be transformed to the matrix B such that B A = I. The inverse of A can therefore be obtained by performing Jordan elimination on the matrix M = A I so as to reduce the first ν(A) columns to the identity. The last ν(A) columns are then the inverse of A. (a) Write a program to determine the inverse of A by Jordan elimination. (b) The sequence of operations which reduce the ith column of A to ∊i is called the ith step of the process, and the ith diagonal element at the beginning of the ith step is called the ith pivot element. Modify the program of part (a) so that each step is preceded by a column permutation which yields the largest (in absolute value) pivot element possible. This modification tends to reduce the accumulation of round-off errors. (c) In the Jordan elimination of part (a), it is unnecessary to store the identity matrix explicitly, and, since the ith column is first affected at the ith step, only one new column need be brought in at each step. Moreover, the ith column of A may be discarded after its reduction to ∊i on the ith step, and it is therefore necessary to store only a square matrix at all times. Show that by shifting all columns to the left and by moving the rows upward cyclically, a very uniform process results, with the pivot element in the leading position at every step [Iverson (1954) or Rutishauser (1959)]. Write a program for the process. (d) Modify part (c) to allow the choice of pivot elements as in part (b). The effects of the permutation on the not explicitly recorded identity cannot be indicated directly, but the performance of the same set of permutations in reverse order upon the rows of the resulting inverse produces the same result. Verify this and program the process. (a) Show that a group [Jacobson (1951)] can be represented by a square matrix M such that each row and each column is a permutation vector. (b) Show that M i = Mi = ⍳1 for some i. (c) What are the necessary and sufficient conditions that the group represented by M be Abelian? (d) What a program to determine all cyclic subgroups of a group represented by M.
(a) all partitions U of a given integer n.
(b) all distinct partitions of n, where U and V are considered equivalent if p = +/U is a permutation of q = +/V. (d) (x y) × (x y) = (x × y) + (x × y) + 2(↓ x × ↑ y) (↓ x × ↑ y). (a) this agrees with the usual definition [Margenau and Murphy (1943)]. (a) [x · y] = [x] × [y] × (x σ y). Note that [x · y] is the area enclosed by the parallelogram defined by x and y. (c) (x · y) z = x (y · z). p, q, r Constant, coefficient of row index, and coefficient of column index in the linear function for the representation of Γ(x). b Based used in representing elements of Γ(x). g Dimension of π of each element of Γ(x). f Leading address of ⍴(xk). d Dimension of ⍴(xk) in π. C Encoding matrix for components of x.
f Format vector for C.
z Character encoded by xk. Program 3.3. A linear representation is assumed for Γ(x), with element Γji(x) represented by the infix ((p + qi + rj) ↓ ⍺g)/π. Moreover, each element of Γ(x) is assumed to be represented in a base b number system. Step 1 determines the leading address of the representation of Γ1k(x). Step 2 specifies f as the base b value of this representation, i.e., as the leading address of ⍴(xk). Steps 3 and 4 specify d as the dimension of xk in π, and step 5 therefore specifies z as the representation of xk. Steps 7-9 perform the decoding of z = ⍴(xk) to obtain z as the actual value of xk. Since this process is normally performed by human or mechanical means (e.g., a printer) outside the purview of the programmer, it is here expressed directly in terms of the encoding matrix C rather than in terms of its representation. The left-pointing exit on step 7 is followed only if z does not occur as an entry in the encoding matrix. The form chosen for the grid matrix is one of several possible. The two columns could, for example, represent the leading and final addresses of the corresponding representations or the dimensions and final addresses. The present choice of leading address f and dimension d is, however, the most convenient for use in conjunction with the notation adopted for infixes; the logical vector (f ↓ ⍺d) selects the appropriate infix. Γ(x) = 17 2 . However, if the representation of Γ(x) is itself linear, then insertions, deletions, and permutations in x will occasion changes in all components of Γ(x) whose indices are affected. The need for a linear representation of the grid matrix (and hence for all linear representations) can be obviated by the use of a chained representation defined as follows. Consider a vector y, each of whose components yk has a solid representation ⍴(yk) whose infixes (g ↓ ⍺g)/⍴(yk) and ⍺g/⍴(yk) are, respectively, the dimension of ⍴(yk) in π and the leading address of the representation of the (cyclically) succeeding component of y (both in a base b system), and whose suffix 2g/⍴(yk) is the representation of the kth component of some vector x. Then (the representation of) y is called a chained representation of x. In other words, the representation of y incorporates its own grid matrix (with the address column Γ1(y) rotated upward by one place) as well as the representation of the vector x.
is a suitable chained representation of x. The parameters required in executing an algorithm on a chained representation y are g, the common dimension in π of the elements of the grid matrix Γ1(y); b, the base of the number system employed in their representation; and f and h, the leading address and index, respectively, of the representation of some one component of y. The parameters g and b are usually common to the entire set of chained representations in use. Program 3.4 illustrates the type of algorithm required to determine ⍴(xk) from a given chained representation of x.
h, f f is the leading address of the hth component of the chained representation of x.
b Base used for representation of the elements of the grid matrix. g Dimension in π of elements of the grid matrix. d Dimension in π of kth component of the chained representation of x.
z kth component of the chained representation of x. Program 3.4. The loop (1-3) is executed ν(x)|0(k – h) times, with the result that at step 4 the parameter f is the leading address of ⍴(yk). Step 4 therefore specifies d as the dimension of ⍴(xk), that is, as the base b value of Γ2k(y). Step 5 then specifies z as ⍴(yk). Step 6 deletes those components of z which represent the elements of the grid matrix, leaving ⍴(xk). The parameters f and h are themselves respecified in the execution of the algorithm so that h becomes k and f becomes, appropriately, the leading address of ⍴(yk). A subsequent execution then begins from this new initial condition. The chained representation used thus far is cyclic and contains no internal identification of the first or the last components. Such an identification can be incorporated by adding a null component between the last and first components of x. Alternatively the identification may be achieved without augmenting the dimension but by sacrificing the end-around chaining, i.e., by replacing the last component of ↑Γ1(y) by a null element. Moreover, a chained representation may be entered (i.e., the scan may be begun) at anyone of several points, provided only that the index h and corresponding leading address f are known for each of the points. The number of components of a chained representation scanned (steps 1-3 of Program 3.4) in selecting the kth component of x is given by ν(x)|0(k – h), where h is the index of the component last selected. The selection operation is therefore most efficient when the components are selected in ascending order on the index. The chaining is effective in the forward direction only, and the component (h – 1) would be obtained only by a complete cyclic forward scan of ν(x) – 1 components. The representation is therefore called a forward chain. A backward chain can be formed by incorporating the vector ↓Γ1(y) instead of ↑Γ1(y), and a double chain results from incorporating both. A vector x which is respecified only by either deleting the final component or by adding a new final component (i.e., by operations of the form x ← 1/x, or x ← x (z)) behaves as a stack (cf. Exercise 2.6). A backward-chained representation is clearly convenient for such a stack. executed on a forward-chained representation of x. The unused segments representing the components of /x are returned to a backward-chained stack or pool of available components. A linear representation can usually be used for logical control vectors such as v; in any case the problems involved in their representation are relatively trivial and will be subordinated by expressing each operation directly in terms of the logical vectors and not in terms of the physical components representing them. h Leading address of last preceding component of v/x. p Leading address of last preceding component of pool of available segments. g Dimension in π of elements of grid matrices. b Base of representation of elements of grid matrices. Program 3.5. In the major loop (6-23), k determines the index of the current component vk, and i and j determine the leading addresses of ⍴(xk) and ⍴(xk+1), respectively. These three parameters are cycled through successive values by steps 7, 8, and 12 and are initialized by steps 2,5, and 12. If vk = 0, the infix ⍴(xk) is returned to the pool by steps 21, 22, 23, and 6 so as to construct a backward chain. The parameter x specifies the leading address of ⍴(x1) unless ν(x) = 0, in which case x is null. Step 1 terminates the process if ν(x) = 0, and otherwise step 4 respecifies x as the null element. If v = 0, this null value of x remains; if not, the first nonzero component of v causes a branch to step 14. Since x = ∘, step 15 is executed to respecify x as the leading address of ⍴((v/x)1). Step 16 then specifies h, the leading address of the last completed component of v/x. Step 15 is never again executed. Components of v/x other than the first must each be chained (in a forward chain) to the preceding one. Hence the leading address i of a newly added component must be inserted in the last preceding component (whose leading address is h). This is normally done by steps 18, 19, and 6; step 20 respecifies h. If, however, the component xk–1 were also included, it would appear as the last completed component of v/x and would already be chained to the new component xk. This situation is recognized by step 17 and occasions a branch to step 16. Step 16 then respecifies h and repeats the loop without executing steps 18, 19, and 6. The process terminates when the cycle through the chained representation of x is completed, that is, when i returns to the original value of x, preserved as t by step 3. Step 10 is then executed, terminating the process directly if ν(v/x) = 0. Otherwise, step 11 is executed to close the chain of v/x, that is, to insert x, the leading address of ⍴((v/x)1), in the representation of the last component of v/x. A chained representation can be generalized to allow the direct representation of more complex constructs, such as trees, by incorporating the address of each of the successor components associated with a given component. This notion is formalized in the chain list matrix of Sec. 3.4. The same scheme can also be employed to produce an efficient combined representation of two or more vectors which share certain common components. If, for example, xj = xk, and chained representations are used for both x and z, then x may be represented in standard form except that component xj incorporates a secondary address, which is the leading address of zk+1. Moreover z has a standard representation except that zk–1 is chained to xj with an indicator to show that the secondary address of the succeeding component is to be used. Deletion of any vector component in such a shared system must occasion only the corresponding change in the address chain of the vector, the actual representation of the component being deleted only when no associated address remains. If the set a is the range of the components of the physical vector π, and if some element, say a1 is reserved as a partition symbol and is excluded from use in the normal representation of quantities, it can be inserted to demark the end (or beginning) of an infix of π. If the vector y is represented by a single infix of π such that the beginning of component yj+1 follows immediately after the terminal partition of yj, then the structure of y is completely represented by the partitions, and y is called a partitioned representation. A partitioned representation can be used for more complex operands, such as matrices, if a set of two or more distinct partition symbols are provided, one for each level of structure. The distinct partition symbols can, of course, be represented by multiple occurrences of a single symbol a1 rather than by distinct members of a. A partitioned representation is similar to a double-chained representation without end-around chaining in the following particular: beginning from component yi, the component yj can be reached only by scanning all intervening components between i and j in increasing or decreasing order according as i < j or i > j. The file notation introduced in Sec. 1.22 clearly provides the operations appropriate to a partitioned representation of a vector, with conventions which suppress all inessential references to the partitions themselves. The use of a partition to demark the end of an infix is particularly convenient when the infix must be processed component by component for other reasons, as in the use of magnetic tape or other serial storage. The partition also appears to be more economical than the grid matrix, which it replaces. This apparent economy is, however, somewhat illusory, since the reservation of a special partition symbol reduces the information content of each nonpartition component by the factor log2(ν(a) – 1) ÷ log2 ν(a), where a is the range of the components of π.
Partitions can be employed in chained representations. For example, the dimension in π of each component of a chained representation y can be specified implicitly by terminal partitions instead of explicitly by the vector Γ2(y) of the grid matrix. Thus if the elements of Γ1(y) are of dimension g in π, then ⍵1/⍴(yj) = a1, and ( g ∧ 1)/⍴(yj) = ⍴(xj), where x is the vector represented by y. Program 3.6 shows the determination of ⍴(xk) from a chained representation y with terminal partitions a1. g Dimension in π of the elements of the grid matrix. z kth component of the chained representation of x exclusive of the terminal partition symbol. d Dimension of z in π. Program 3.6. The program is similar to Program 3.4 and the step numbering indicates the correspondences. The dimension d is so determined (steps 4a-d) as to exclude the terminal partition itself from the quantity z specified by step 5. Since only the first column of the grid matrix is incorporated in the partitioned representation, step 6 excises a prefix of dimension g rather than 2g as in Program 3.4. Components of the physical vector π in use for the representation of one quantity must not be allocated to the representation of some other quantity. The construction of a chained representation therefore poses one problem not encountered in its use, namely, the specification and observation of restrictions on the availability of components of π. The restrictions can conveniently be specified as a pool, consisting of the available components of π. Each allocation made must then be reflected in a corresponding change in the pool. Moreover, as each piece of data is deleted, the components allocated to it are returned to the pool. If, as in Program 3.5, a pool is treated as a stack, then the component next taken from the pool is the component last added to it. The queue of components in the pool thus obeys a so-called last in first out, or LIFO discipline. The dimension in π of the last component of a pool will not, in general, agree with the dimension required for the next quantity it is called on to represent. If it exceeds the requirements, the extra segment may be left in the pool, and the pool therefore tends to accrue more and more components of smaller and smaller dimension. Hence it may be wise, or even essential, to revise the pool occasionally so as to coalesce the segments into the smallest possible number of infixes. This process can even be extended to allow substitutions in other vectors in order to return to the pool short segments which may unite existing segments of the pool. This, however, will require a systematic scan of the chained vectors. If the dimension of the last component (or perhaps of all components) of the pool falls short of the requirements for representing a new quantity, segments of the pool can be chained together. This requires the use of a special partition symbol or other indication to distinguish two types of links, one which marks the end of a given representation and one which does not. More generally, it may be convenient to use multilevel partition symbols to distinguish several levels of links, as was suggested for the representation of a matrix. Queue disciplines other than LIFO may be used. Three other types of primary interest in allocation queues are the FIFO (first in first out), the dimension-ordered, and the address-ordered disciplines. FIFO uses a forward chain and may be preferred over LIFO because it uses the entire original pool before using any returned (and usually shorter) segments. The components of a dimension-ordered pool are maintained in ascending (or descending) order on their dimensions in π. This arrangement is convenient in selecting a pool element according to the dimension required. The components of an address-ordered pool are arranged in ascending order on their leading addresses. This arrangement facilitates the fusion of components which together form an infix of π. If each of the available components of π is set to a special value which is used for no other purpose, then the available components can be determined by a scan of π. Such a pool has no structure imposed by chaining and will be called a marked pool. A marked pool requires little maintenance, since components returned to it are simply marked, but selection from it requires a scan of π and is therefore relatively slow. The use of marked and chained pools may also be combined—all returned components go to a marked pool which is left undisturbed until the chained pool is exhausted, at which time the entire marked pool is organized into a chained pool. Since any structured operand can first be reduced to an equivalent vector, the problems of representation can be discussed in terms of vectors alone. The characteristics of the linear, chained, and partitioned representations of a vector may be summarized as follows. A linear representation permits the address of any component to be computed directly as a linear function of its indices and hence requires no scanning of the vector. However, the strict limitations which it imposes on allocation may engender: (1) conflicts with allocations for other operands, (2) waste of storage due to the imposition of a common dimension in π for all components, or (3) uneconomical execution due to the extensive reallocations occasioned by the insertion or deletion of other than terminal components. The concept of the grid matrix is helpful even when the corresponding allocation is implicit in the program. The explicit use of a grid matrix which is itself in a linear representation removes the restrictions on the allocation of the vector itself while retaining the advantage of direct address computation. The address computation differs from the linear case only in the addition of a single reference to the grid matrix and hence requires no scanning. The difficulties enumerated for the direct linear representation are not eliminated but merely shifted to the linearly represented grid matrix itself, where they may, however, prove much less serious. A chained representation allows virtually arbitrary allocation, relatively simple operations for the insertion and deletion of components, the direct representation of more complex structures such as trees, and economical joint representations of vectors which have one or more components in common. However, a chained representation requires extra storage for the grid matrix which it incorporates and occasions additional operations for scanning when the components are selected in other than serial order. The required scanning can be reduced by the retention of auxiliary information which allows the chained representation to be entered at several points. A partitioned representation requires the allocation of a single infix of π, and selection requires a fine scan, i.e., a component-by-component scan of π to detect partition symbols. Partitioning removes the need to incorporate the grid matrix explicitly and does not impose a common dimension in π for all components. Mixed systems employing combinations of linear, chained, and partitioned representations are frequently advantageous. Block chaining, for example, involves the chaining of blocks, each consisting of an infix of π and each serving as a linear representation of some infix of the represented vector. Alternatively, each chained block may be a partitioned representation of some infix. k = i + μj. and j = ν |0 h = ⌊k ÷ μ⌋. to yield h = ν × (μ |0 k) + ⌊k ÷ μ⌋. Similarly, k = μ × (ν |0 h) + ⌊h ÷ ν⌋. h = ν × (μ∊ |0 ⍳0) + ⌊⍳0 ÷ μ∊⌋. The expression for the kth component of h is identical with the expression for h above. Hence, if c = h∫0r, then ck = rhk = rh as required. If the row list (or column list) is itself represented linearly, then the address of any component Aji is obtained as a linear function of the indices i and j. If either a file or a chained representation is to be used for the list vector, then the components are processed most efficiently in serial order, and the use of column list or row list is dictated by the particular processes to be effected. If a large proportion of the elements of a matrix are null elements, it is called a sparse matrix. Sparse matrices occur frequently in numerical work (where zero serves as the null element), particularly in the treatment of partial difference equations. A sparse matrix A can be represented compactly by the row list r = U/A, and the logical matrix U, where U = (A ≠ 0). The matrix A may then be obtained by expansion: A = U\r. Alternatively, the column list c = (A ≠ 0)//A may be used. The transformation between the column list c and row list r must, in general, be performed as a sequential operation on the elements of U. Since it is frequently necessary to scan a given matrix in both row and column order (e.g., as either pre- or post-multiplier in a matrix multiplication), neither the row list nor the column list alone is satisfactory. A chaining system can, however, be devised to provide both row and column scanning. The matrix L will be called a row-chained representation of A and may be used, together with the vector f, for the efficient scanning of any row Ai as illustrated by Program 3.7. The vector L3 can be modified so as to give the address in π directly rather than the row index in L of the next element in the row, and Program 3.7 can then be easily re-expressed in terms of the physical vector π.
fi Row index in L of first nonzero element of row Ai. fi = ∘ if Ai = 0.
k Row index in L of next element. L1 List of nonzero elements of A.
L2k Column index in A of L1k. L3k Row index in L of next nonzero element following L1k in its row in A. L3k = ∘ if no such element exists. Program 3.7. Step 2 yields the index in L of the first element of the ith row of A. Step 4 determines its column index j, and step 6 determines the index of the succeeding component. The process terminates at step 3 when the scan of the row is completed. If L1 is chosen as a row list, the vector L3 reduces to the form L3k = k + 1 or L3k = ∘. Its function can then be served instead by incrementation of the index k and by the use of the logical vector u = (L3k = ∘∊) for determining the end of each row. The construction of a column-chained representation is analogous to that of a row-chained representation, and the two representations can be combined in a single matrix L which gives both row and column chaining employing but a single representation (that is, L1) of the nonzero elements of A. 5. by various chain list matrices. The full left and right lists seldom prove more convenient than the more concise left and right lists. Except for the special case of a homogeneous tree, both the right list and the left list are awkward to use for path tracing. This function is better served by the chain list matrix, to be defined as a formalization of the chaining scheme suggested in Sec. 3.2. In certain important special cases, the various list representations of trees may be simplified. If the degree of each node is a known function δ of the value of the node, then for any list matrix M, M1i = δ(M2i), and the degree vector M1 may be eliminated without loss. The node vector alone then represents the tree and may be referred to as a right or left list vector as the case may be. v = (∧, ¯, x, ∨, y, z). which, together with the logical vector (M1 = 0), forms a leaf list matrix that describes the tree. Moreover, if the values of the leaves are distinguishable from the components of the degree vector, the logical vector (M1 = 0) may also be dropped. The use of the right list matrix is illustrated by the repeated selection sort treated in Sec. 6.4. The use of left lists will be illustrated here by two examples, each of interest in its own right: the partitioning of the left list of an n-tuply rooted tree to yield the left lists of the component singular subtrees and the construction of a Huffman minimum-redundancy prefix code. Z Given left list of T.
i Row index of Z in ascending scan. r Indicated number of roots of current rooted subtree. m Moment of current rooted subtree. p Partition vector of Z, that is, pj = μ(Tj). Example 3.1. Partitioning of an n-tuply rooted tree. Program 3.9 shows a scheme for partitioning a left list Z of a tree T into component subtrees, i.e., for determining the vector p such that pj is the moment of the singular subtree Tj. Thus ν(p) = μ1(T), pj = μ(Tj), and the infix ((p a j–1) ↓ a pj)//Z is the left list of Tj. The loop 6-10 scans successive components of the degree vector Z1 (in ascending order) and computes r, the indicated number of roots. The value of r increases by, at most, one per iteration, and when r becomes unity, the end of a singly rooted tree has been reached. Its moment m is then appended (step 11) as a new final component of the partition vector p, the parameters m and r are reset, and the scan of the next rooted tree is begun. Normal termination occurs at step 3; termination at step 6 indicates ill formation of Z. In so-called fixed length coding the vectors xi have a common dimension d, and the decoding of a message m (consisting of the catenation of vectors xi) involves the selection of successive infixes of dimension d. If the probability distribution of the characters a1 occurring in messages is not uniform, more compact encoding may be achieved by using variable length codes and assigning the shorter codes to the more frequent characters. Decoding of a message in variable length coding can be performed only if the boundaries between the successive xi are indicated in some way. The boundaries between characters in a message in variable length code may be demarked by special partition symbols (which is inefficient) or by using a prefix code in which no legitimate code point xi is the prefix of any other legitimate code point, including itself. The index vectors of the leaves of any tree possess this property; conversely, any set of prefix codes can be arrayed as the leaves of some tree. Hence if each character of the set to be encoded is assigned as the leaf of a common tree, and if each character is encoded by the associated index vector, a so-called prefix code is attained. Figure 3.10 furnishes an example of a binary code (i.e., the branching ratios do not exceed two) constructed in this manner. 0-origin indexing is used. The discussion will be limited to binary trees. If fi is the frequency of the ith character and li is the length of the assigned code (i.e., the length of path to the root), then the most efficient code is attained by minimizing the scalar product f l. This may be achieved by the following construction, shown to be optimal by Huffman (1952). First, the characters to be encoded are all considered as roots, and the two roots of lowest frequency are rooted to an auxiliary node (shown as a null element in Fig. 3.10), which is then assigned their combined frequency. The process is repeated until only two roots remain. The tree of Fig. 3.10 is optimal with respect to the frequencies shown to the left of the leaves. The appropriate combined frequencies are shown to the left of each of the nonleaves. Programs 3.11 and 3.12 show the construction of the tree T representing a Huffman code for a set of characters ci with frequencies fi the former in terms of the tree itself and the latter in terms of its left list. Program 3.11. The frequency vector f is permuted (step 5) to bring it to ascending order, and the tree is subjected (step 3) to the same permutation. Step 4 replaces the first two rooted subtrees of T by the single subtree obtained by rooting them in a null, and step 6 makes the corresponding alterations in the frequency vector. The tree is initialized (step 1) as a one-level tree whose roots are the given characters, and the process terminates when the number of roots of T has been reduced to two. z Left list of Huffman tree. fi Frequency of ith subtree of z.
p Partition vector pi is the moment of the ith subtree of z.
x Reordered left list with subtrees in ascending order on frequency. Program 3.12. The tree T of Program 3.11 is represented by the left list node vector z, in conjunction with the implicit degree vector d = 2 × (z = ∘∊). The algorithm differs from Program 3.11 primarily in the reordering of the subtrees (steps 6-9). Step 7 appends to x the left list of the ith subtree (of the reordered tree) selected by the partition vector p according to the conventions of Program 3.9. Step 1a prefixes x by the new null root, and steps 11-12 redefine p appropriately. Program 1.21 can be applied to the left list produced by Program 3.12 to determine the associated index matrix (in a 0-origin system), and hence the actual codes assigned. It is not essential that the characters be assigned to leaves in precisely the order specified by Programs 3.11 and 3.12, and it is sufficient that the dimension of the leaf index increase monotonically with decreasing frequency of the character. It is therefore unnecessary to carry the characters themselves through the process; it suffices to determine the structure of the tree, sort the corresponding index matrix to right list order (which is ordered on dimension of the index vectors), and assign the characters (in decreasing order by frequency) to successive leaves. Since the structure of such a tree (whose nodes have a common irrelevant value and whose nonleaves all have a common branching ratio equal to the number of roots) is sufficiently determined by the moment vector μ(T), the process of Program 3.12 can be simplified. The full chain list matrix of a tree T is a matrix P of dimension μ(T) × (δ(T) + 2) defined as follows: P2 is some node vector of T, P1 is the associated degree vector, Pj+2i is null if j exceeds the associated degree P1i and is otherwise the row index in P of the jth node emanating from node P2i. Table 3.13 shows a full chain list matrix for the tree of Fig. 1.16. A full chain list matrix is called a full right (left) chain list matrix if the nodes occur in right (left) list order. The full chain list matrix is a formalization of the scheme suggested in the discussion of chained representations (Sec. 3.2). Its convenience in forward path tracing is obvious. Since it does not identify the roots of the tree, an auxiliary vector must be provided for this purpose. However, if the ordering chosen for the nodes is that of a right list, the roots occur first in the list, their number r = ν(P1) – (+/P1) is specified by the degree vector P1, and the need for the auxiliary vector vanishes. Moreover, since a right list groups all nodes emanating from a given node, each row of 2/P is simply a sequence of integers followed by null elements, and the information necessary to path tracing is provided by the column P3 alone. The right chain list matrix of a tree T is therefore defined as 3/P, where P is the full right chain list matrix of T. It is illustrated by Table 3.13b. Program 3.14 shows its use in path tracing. Although the degree vector P1 is redundant (that is, P1 and P3 can be determined one from the other), it provides a direct check (step 6) on the legitimacy of the index vector r which would be difficult to obtain from P3 alone. For a search of the type described by Program 3.14, it is necessary to scan down a level until agreement is reached and then across to the next level. For this type of scan, the filial-heir chain list is compact and convenient. P Right chain list matrix of T.
P1 Degree vector of T.
P2 Node vector of T.
P3 Chaining vector of T.
d Degree of current node. k Base address of the infix containing the current node. i Index of succeeding node in the path Tr. j Current index of index vector r.
The set of (j + 1)th level nodes of the subtree Ti are collectively called the jth filial vector of node i, and the first member of the first filial vector of node i is called the heir of node i. (For brevity, the first filial vector of a node will also be called its filial vector.) If each node is chained only to its successor in the filial vector containing it and to its heir, the resulting representation is called a filial-heir chain list. Formally, the filial-heir representation of a tree T is a matrix F of dimension μ(T) × 4 such that F2 is a node vector of T, F1 is the associated degree vector, F3 is a filial chain such that F3i = j if node F2 j is the successor of node F2i in the smallest filial set containing it and F3i = ∘ if node F2i has no such successor, and F4 is an heir chain such that F4i = h if node F2h is the heir of node F2i and F4i = ∘ if F2i is a leaf. The filial-heir chain list is illustrated in Table 3.13c.  Blaauw, G. A., (1959), “Indexing and Control-Word Techniques”, IBM Journal of Research and Development, vol. 3, pp. 288-301.  Brooks, F.P., Jr., and K.E. Iverson, (1962), (in press) Automatic Data Processing, Wiley, New York.  Burks, A.W., D.W. Warren, and J.B. Wright, (1954), “An Analysis of a Logical Machine Using Parenthesis-free Notation”, Mathematical Tables and Other Aids to Computation, vol. VIII, pp. 53-57.  Dewey, Godfrey, (1923), Relative Frequency of English Speech Sounds, Cambridge University Press, p. 185.  Huffman, D.A., (1952), “A Method for the Construction of Minimum Redundancy Codes”, Proc. IRE, vol. 40, pp. 1098-1101.  Iverson, K.E., (1955), “Report by the Staff of the Computation Laboratory to the American Gas Association and Edison Electric Institute”, Section III, Report No.1, Harvard Computation Laboratory.  Johnson, L.R., (1962), “On Operand Structure, Representation, Storage, and Search”, Research Report # RC-603, IBM Corp.
 Lukasiewicz, Jan, (1951), Aristotle’s Syllogistic from the Standpoint of Modern Formal Logic, Clarendon Press, Oxford, England, p. 78.  Marimont, R.B., (1959), “A New Method of Checking the Consistency of Precedence Matrices”, J. ACM, vol. 6, pp. 164-171.  Ross, I.C., and F. Harary, (1960), “The Square of a Tree”, Bell System Tech. J., vol. XXXIX, pp. 641-8.  Shaw, J.C., A. Newell, H.A. Simon, and T.O. Ellis, (1958), “A Command Structure for Complex Information Processing”, Proc. Western Joint Computer Conference, pp. 119-128.
a. Chained representations have received extensive treatment, frequently under the name “lists”. See, for example, Shaw et al. (1958) and Blaauw (1959). b. Johnson (1962) provides a comprehensive treatment of the representations of trees and discusses the suitability of each representation for a variety of search procedures. , z, ., ,, #, *, +). The expression π ⊆ x will be used to specify the set x as the range of the components of π. (a) the decimal digits d = ⍳0(10) in a ranked fixed-length code for π ⊆ ⍳0(2). Example: x = (6, 8, 9). (b) the set a in a ranked fixed-length code for π ⊆ ⍳0(2). Example: x = (c, a, t). (c) the set a ∪ c ∪ ⍳0(10) in a fixed-length code for π ⊆ ⍳0(10). Example: x = (M, a, y, ∘, 3, ,, 1,9,6,0, .). Example: x = (T, r, o, y, ,, N, ., Y, .). (e) the set a in a Huffman prefix code for π ⊆ ⍳0(2). Assume the frequency distribution given in Dewey (1923). Example: x = (t, r, e, e). 3.2 For each of the cases of Exercise 3.1 write a program which decodes the infix (i ↓ ⍺j)/π, that is, which produces the vector z represented by the infix. The auxiliary physical vector π1 ⊆ s may be employed to represent the first column of the encoding matrix, where s is the set encoded. Perform a partial trace of each program for the example value used in Exercise 3.1. (a) a linear representation (employing null elements for filling to a common dimension in π). (b) a solid representation for each element of m and an appropriate grid matrix itself represented linearly. (d) a double chained representation. (a) For each of the cases of Exercise 3.3, write a program which selects month mk. (b) Trace each program for the case k = 2. (c) For case (d) of Exercise 3.3, write a program which selects mk by forward chaining if k ≤ ν(m)÷2, and by backward chaining if k > ν(m)÷2. ⍴(m12), and such that each row Zi may be partitioned into one or more vectors of the form ⍴(mk) ∘∊, all but the last of which must be of dimension ν[⍴(mk)] + 1. 3.6 Assuming a linear representation for each of the logical vectors involved, and a forward-chained representation for each of the remaining operands, write programs for the following operations. Assume in each case that the arguments x and y need not be retained, and assume the use of a backward-chained pool where necessary. 3.7 Repeat Exercise 3.6(a), using separate grid matrices for x, y, and z instead of chained representations. Specify a suitable linear representation for each of the grid matrices. (a) If a chained representation is used for a vector x, then the selection of a specified component can be made faster by providing a number of alternative starting points for the required scan. State precisely the quantities required in such a process and write a program showing its use. (b) If provision is made for starting the scan at any component of x, the chained representation may itself be simplified. Show precisely what the simplified form is and identify the type of representation to which it is equivalent. 3.9 Frequently a vector x kept in a partitioned representation (for efficient use of storage) must be “unpacked” to a linear or other more accessible form for efficient processing. The converse operation of “packing” is also required. Let the partitioned representation be a file Φ employing an intercomponent partition λ1, and a terminal partition λ2, and write both packing and unpacking programs for each of the following cases. Assume that the maximum dimension in π of any component is n.
(a) A solid linear representation employing null fill. (b) An allocation prescribed by a grid matrix G with G2 = n∊. 3.10 Let π ⊆ ⍳0(2), let the set a be encoded in a five-bit code such that (2∊) ⊥ ⍴(ai) = i, and let each component of the vector x be an (uncapitalized) English word. Using 0-origin indexing throughout, specify a suitable partitioned representation in π for the vector x, and repeat Exercises 3.9(a) and 3.9(b), using it in lieu of the files. 3.12 For each of the following queue disciplines, write programs which take from and return to the pool an infix of length n. Use secondary linking and relegate to a marked pool any infix which is too short for linking. In each case choose the type of chaining best suited to the particular queue discipline. (d) Address-ordered (utilize the possibility of fusing adjacent infixes). 3.13 Give a complete specification of a scheme for representing a tree T by a full chain list matrix which is not in right list order. Write a program (expressed in terms of the physical vector π) which determines the path vector Ti for a given index vector i.
, xn as suggested in Sec. 3.2. Write programs to (i) select component xji, and (ii) delete component xji. , xn be a family of vectors whose components belong to the set 1/[a ∪ ⍳0(10)]. Let the average and the maximum dimensions of the vectors xi be a and m, respectively. Assume that the chaining index is represented in decimal, with each digit represented by one component of π. Determine (as a function of m and n) the value of a below which a chained representation provides more compact storage than a linear representation with null fill. 3.16 Write a program which uses the minimization operation u ← v ⌊ x to determine the ordering permutation vector p ← θ1/(a ⍳1 b). 3.17 Let U = (X ≠ 0) and r = U/X jointly represent the sparse matrix X. (a) Write a program which determines (as a function of U and r) a suitable row-chained and column-chained representation of X. (b) Write a program defined on the representation produced in part (a) to compute the product Y = X X, itself represented in the form V = (Y ≠ 0) and p = V/Y. (c) Write a program to determine the trace (that is, +/I/X) of X from the representation produced in part (a). 3.18 The unique assignment of Huffman codes produced by Program 3.12 is, in general, only one of many equally efficient assignments, since the symbols to be coded need only be assigned, in decreasing order on frequency, to the leaves of the code tree in increasing order on their levels. Show that the structure of the tree produced can be sufficiently described by its moment vector alone, and write a program for the construction of a Huffman code based on this fact. 3.19 Following the notation and terminology used in Program 3.9 for the analogous case of a left list, write a program which determines from the right list R of a tree T, the partition vector p which partitions it by levels. 3.20 Write a program which determines the right list R = ⍺2/]T as a function of the left list L = ⍺2/[T. Incorporate tests of well formation. (a) Show that ([C ]p)ji = 1 if and only if there is a path of length p from node i to node j in the graph (n, C). (b) Show that [C ]p = 0 for some p < ν(C) if and only if (n, C) contains no circuits. (c) If (n, C) contains no circuits, the connection matrix C is said to be “consistent”. The result of part (a) can be used to check consistency. Program the alternative method of Marimont (1959). (d) If H = C ∨ I, then ([H ]p)ji = 1 if and only if i = j or there exists a path from node i to node j of length n ≤ p + 1. Show that for any connection matrix C, [H ]p converges to a limit. (a) whether a given connection matrix C represents a tree. (b) the left list of the tree (n, C). (c) the right list of the tree (n, C). (ii) a right list R.
3.23 Show that (n, C) and (np, Cpp) represent the same graph for any permutation p.
3.24 If (n, C) is a tree and if K = C C, then C can be determined as a function of K (see Ross and Harary, 1960). Write a program for determining C from K.